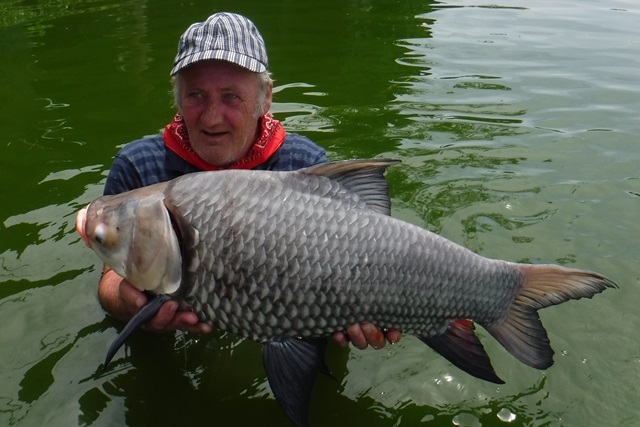 Newly elected carp fishing hall of famer and president of the UK Carp Study Group Terry Eustace was back and this time he was giving the pellets a miss in favour of Urban Baits nutcracker popups, and what a great decision that turned out to be.with him catching nineteen Siamese carp that included four over the 100lb mark and a new pb of 130lb. 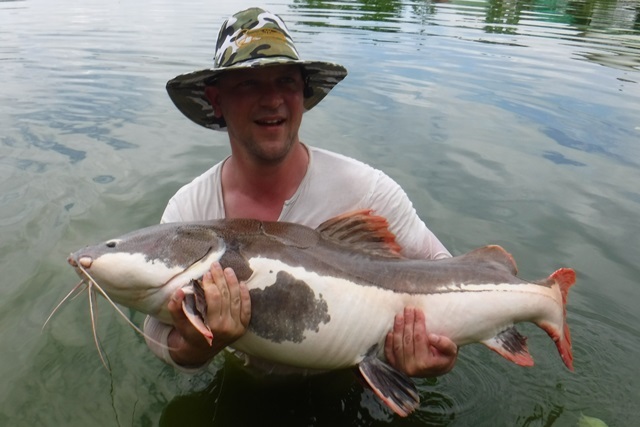 He also smashed his rohu pb with a 42lb specimen and his black ear catfish pb with a fish that far exceeded the current IGFA record at 33lb. 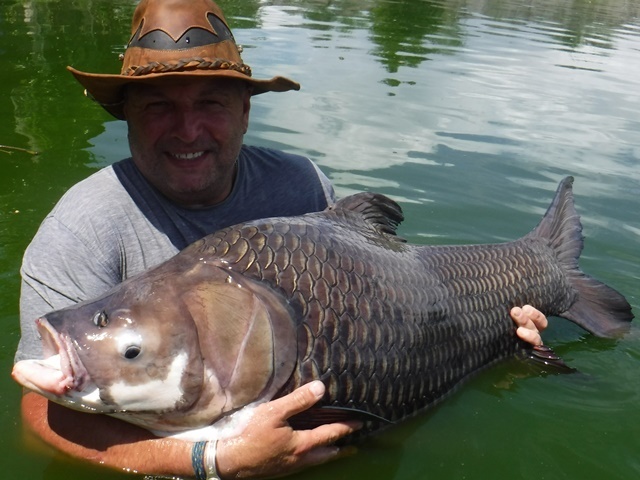 He caught several new species that included Chinese black carp to 32lb, a soldier river barb that also exceeded the current IGFA record. 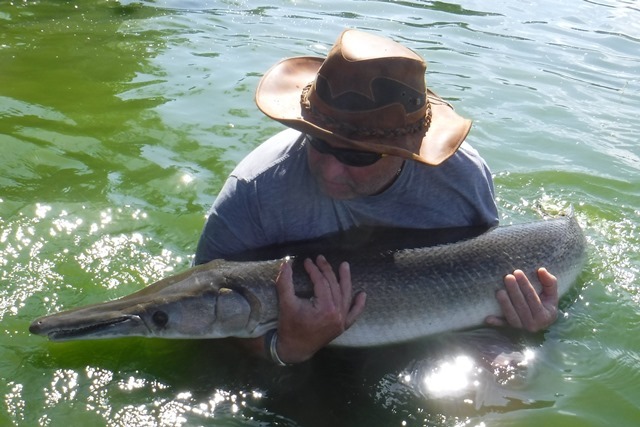 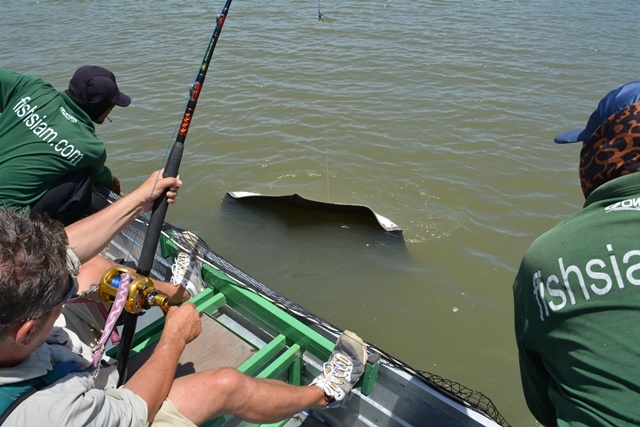 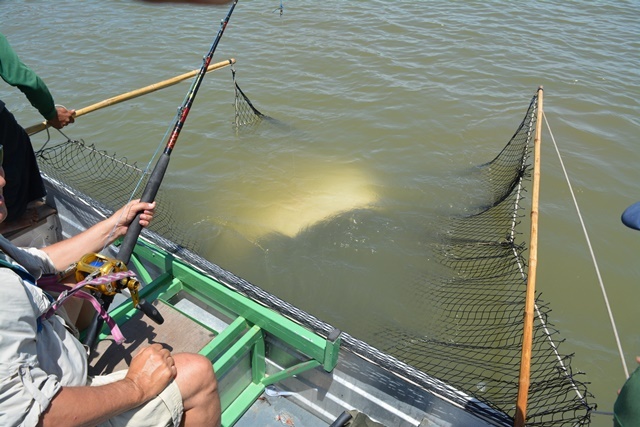 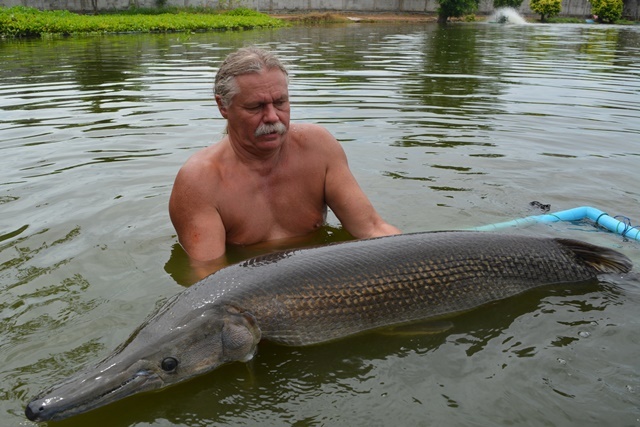 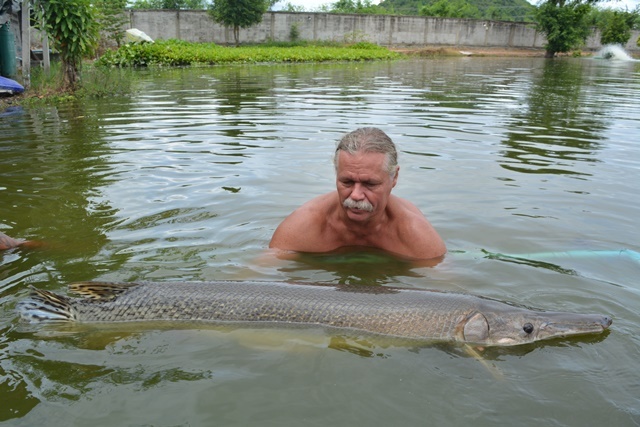 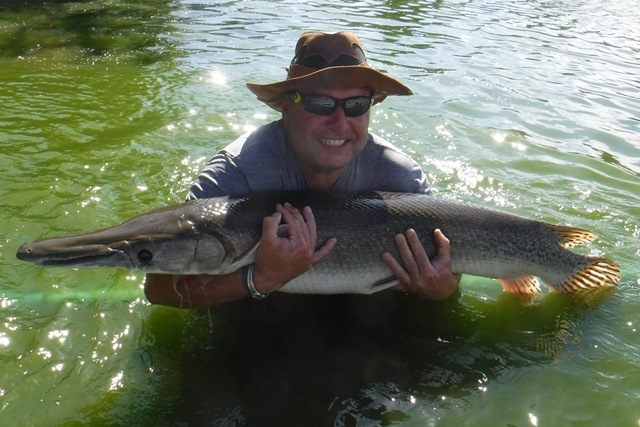 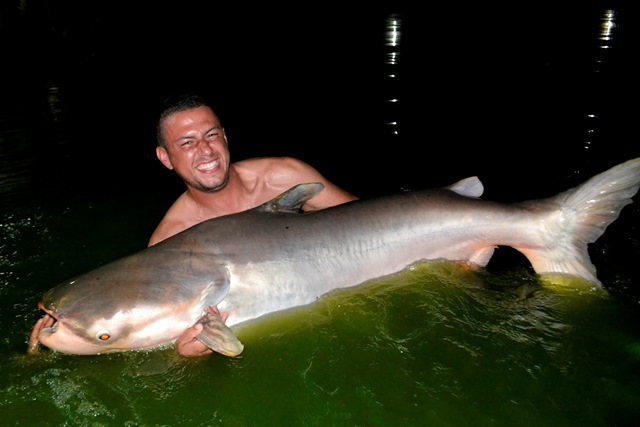 He also added two new species to his list of 100lb+ fish namely alligator gar and big-Y catfish. 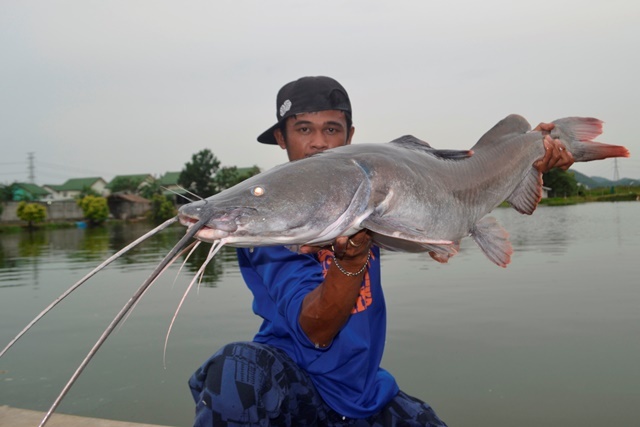 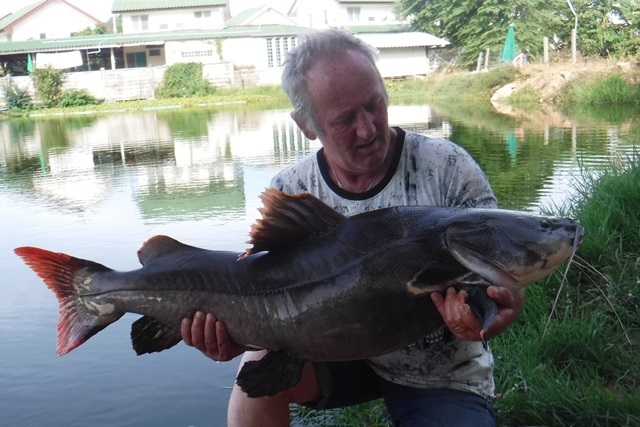 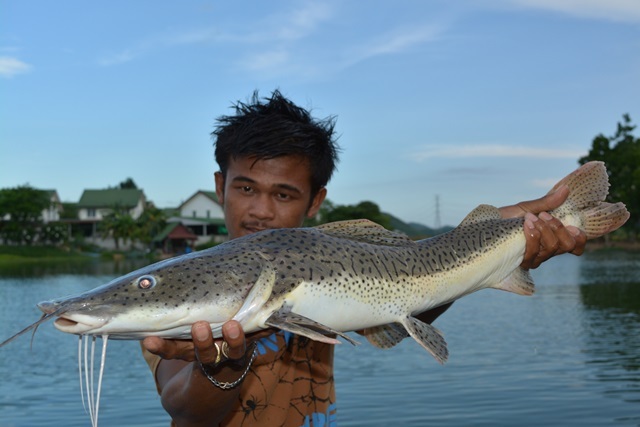 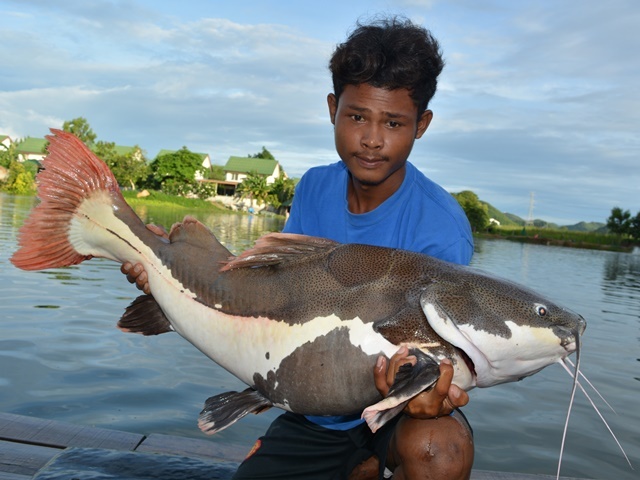 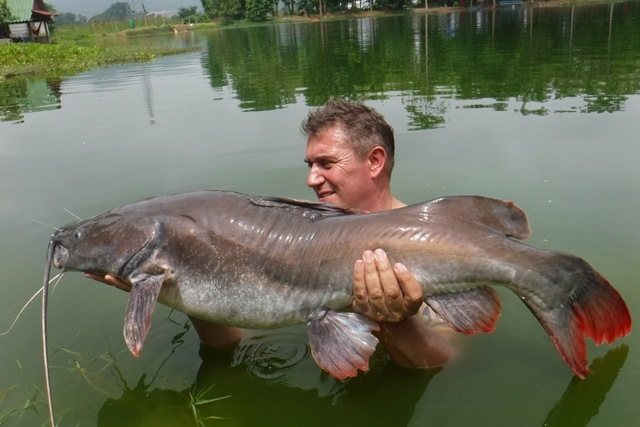 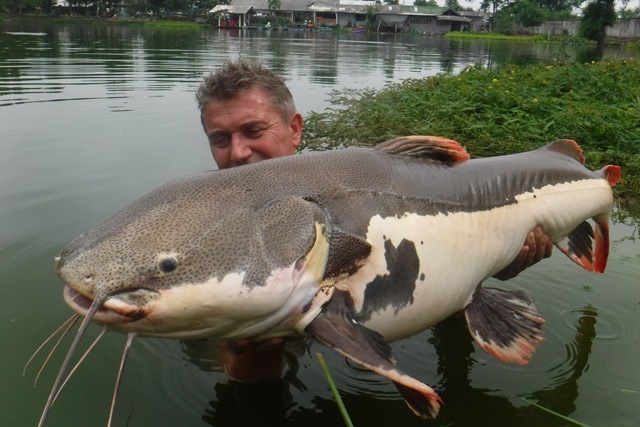 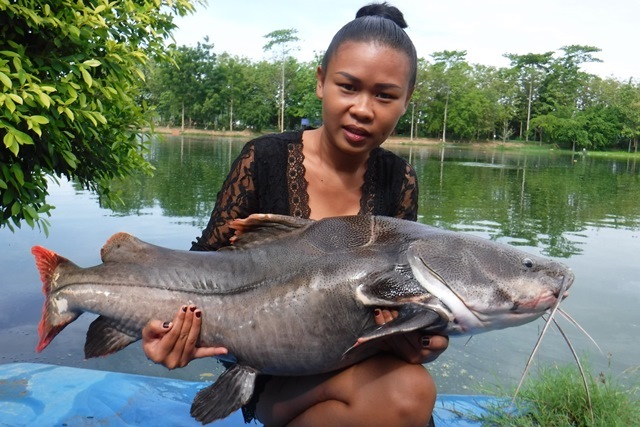 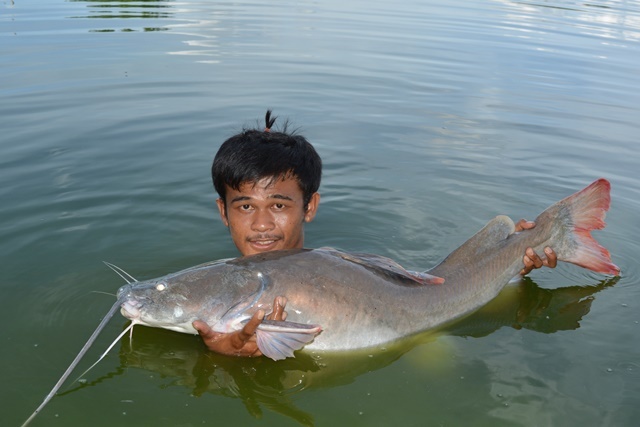 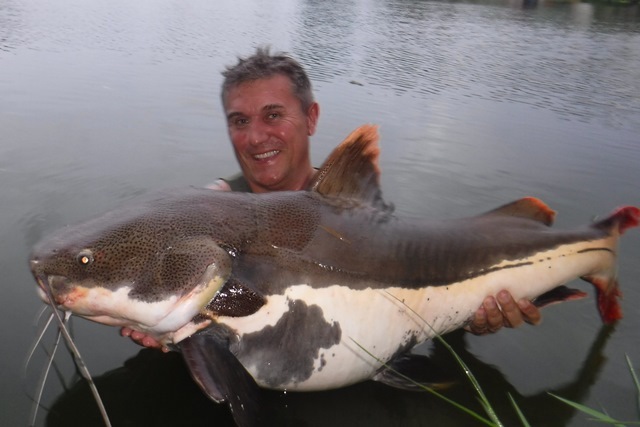 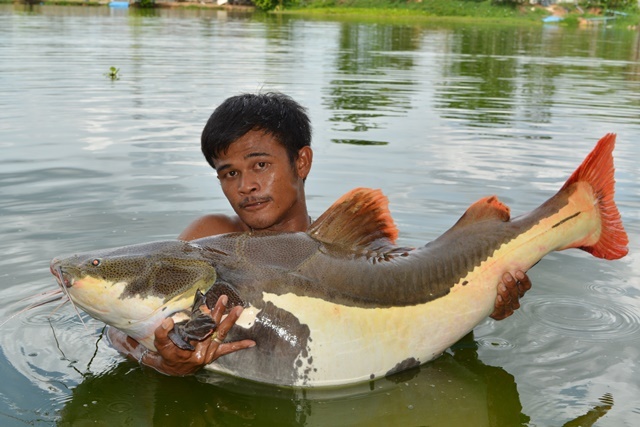 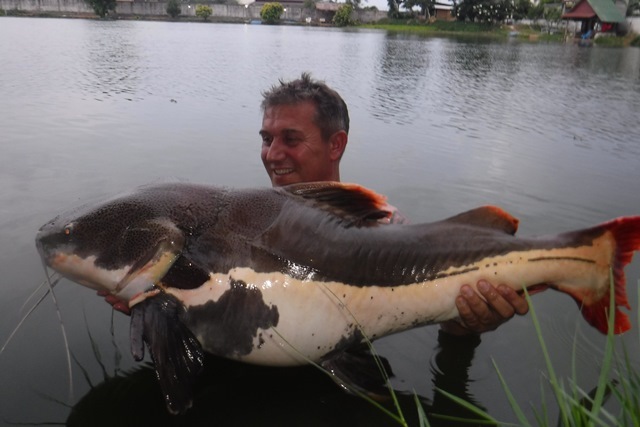 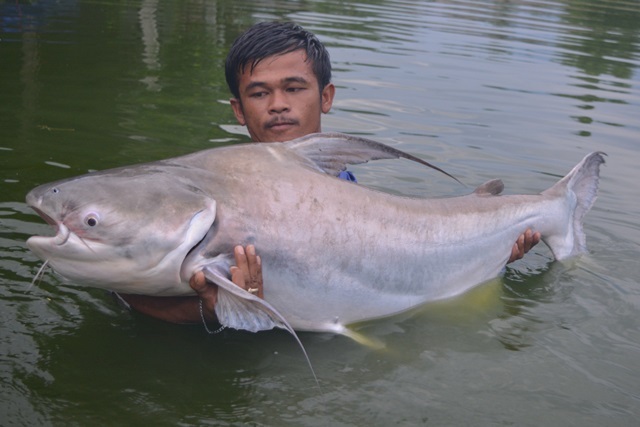 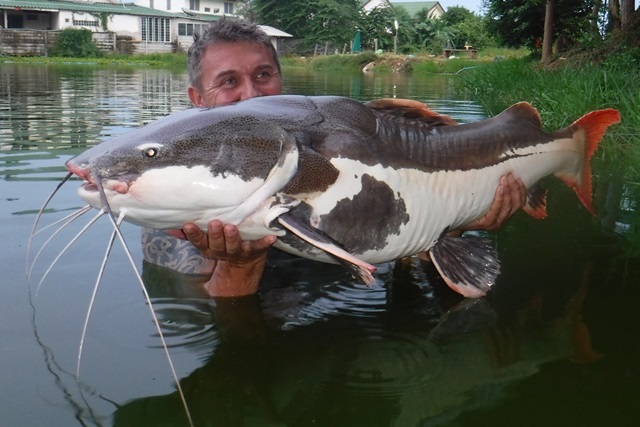 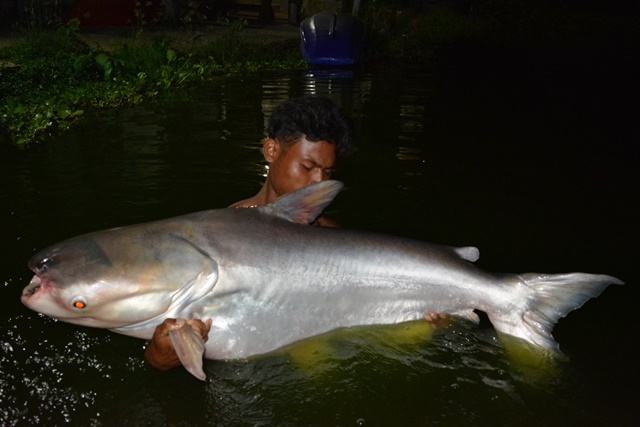 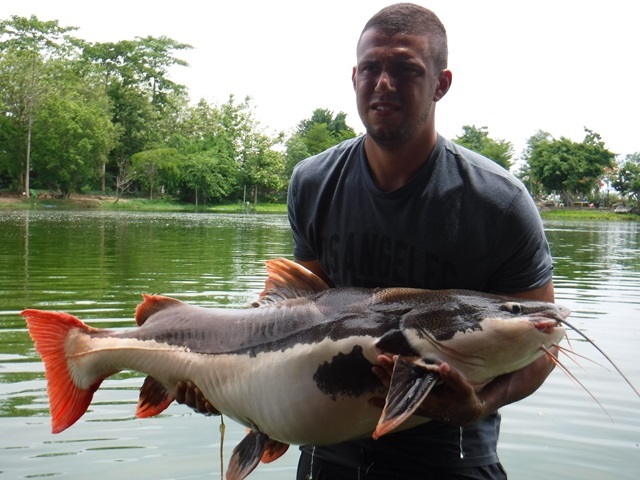 In addition he caught many other species that included Mekong catfish, chao phraya catfish, wallago attu, mollycot and both Amazon and Thai redtail. 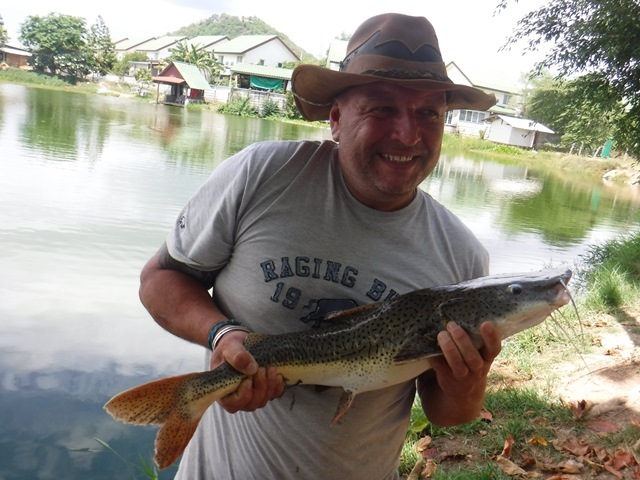 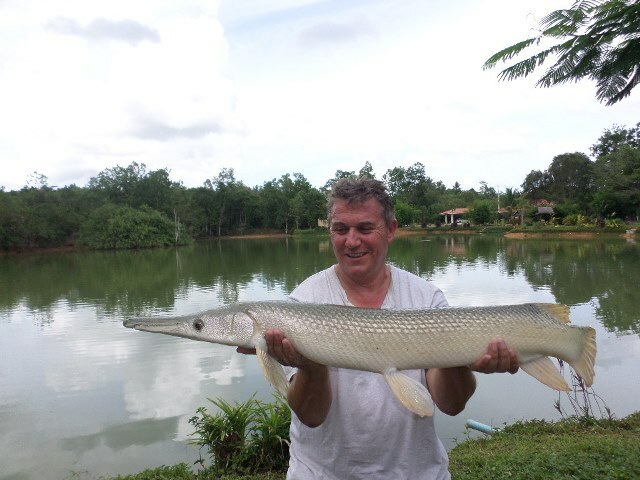 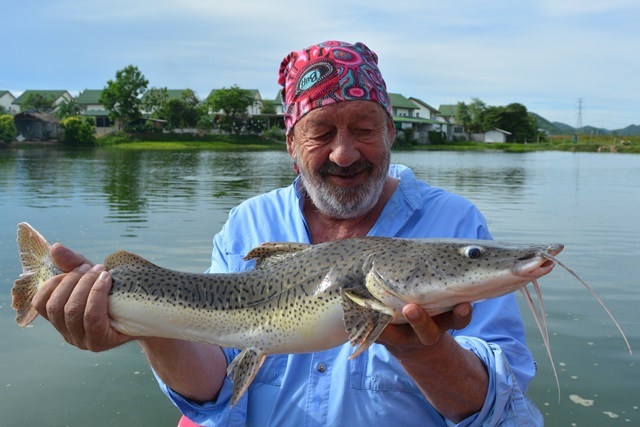 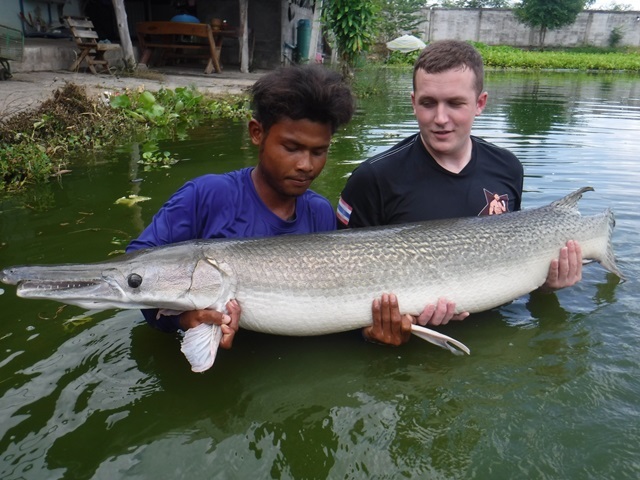 Jamie Lowe a regular on the Thai fishing scene and his mate Mick made their inaugural visit to Palm Tree breaking his alligator gar pb twice in the same day, and catching two new species as well namely tambaqui and big-Y catfish. 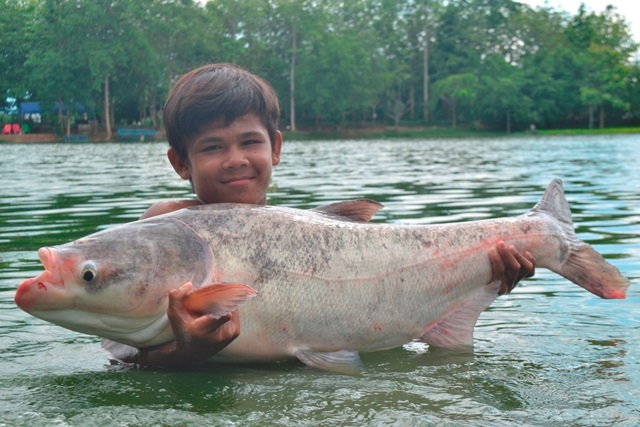 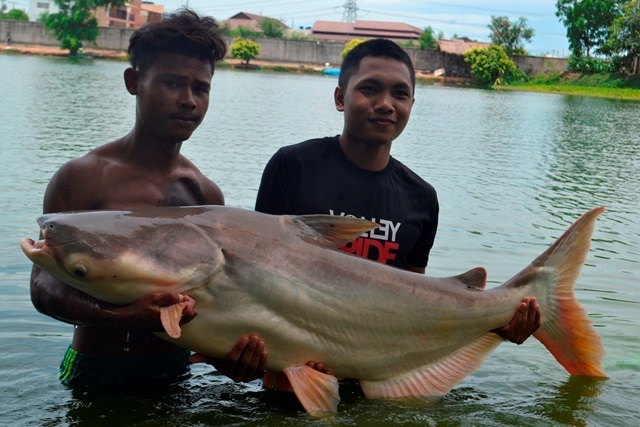 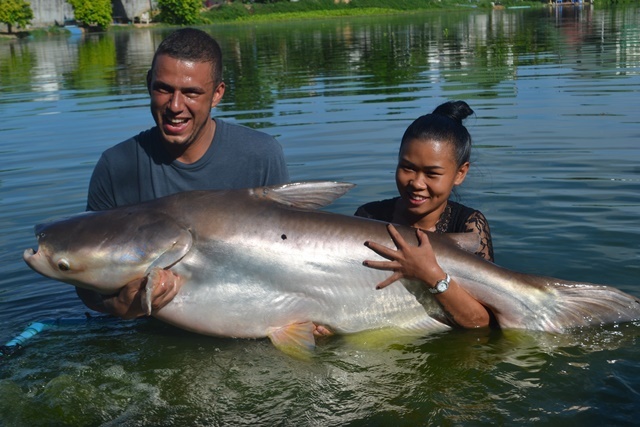 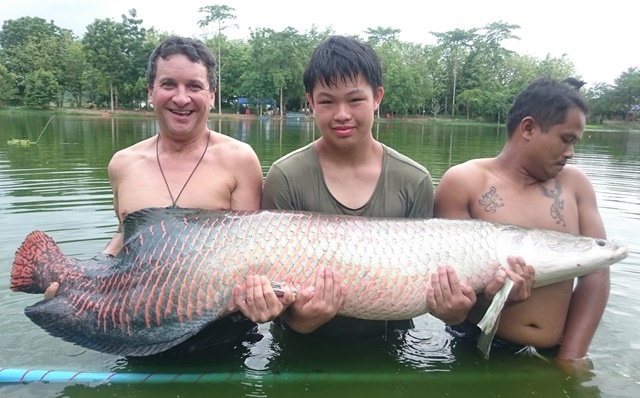 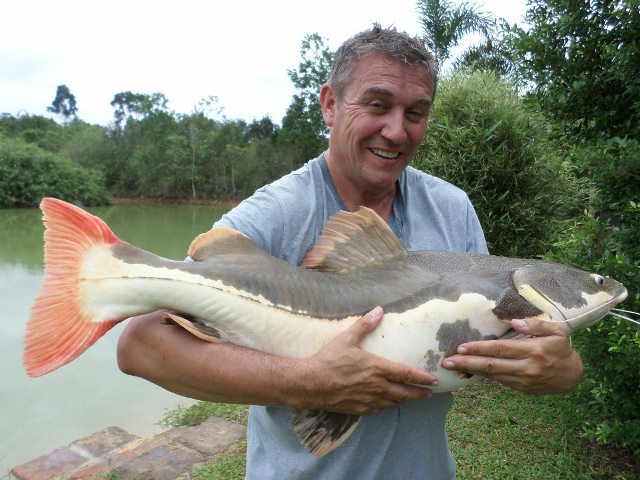 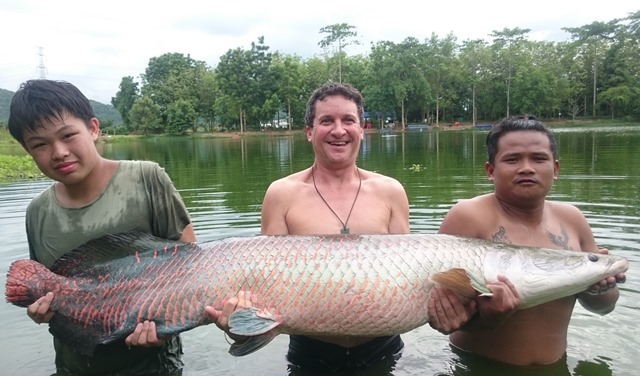 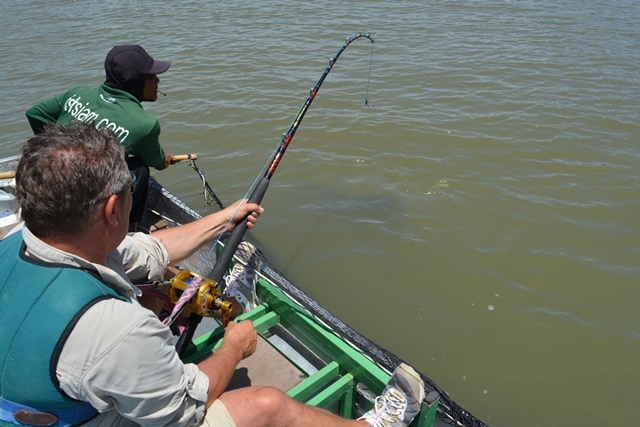 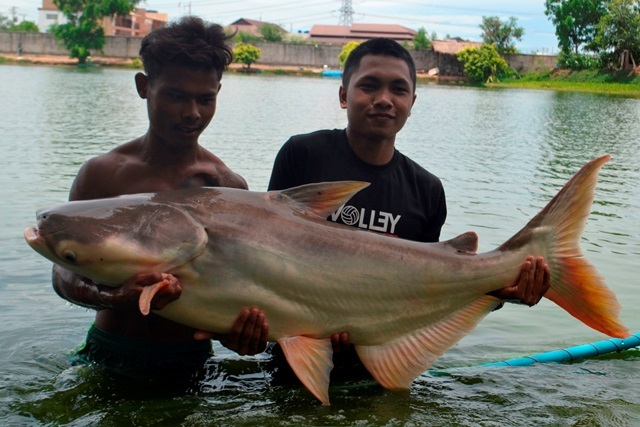 They also caught Mekong catfish, arapaima and Siamese carp. 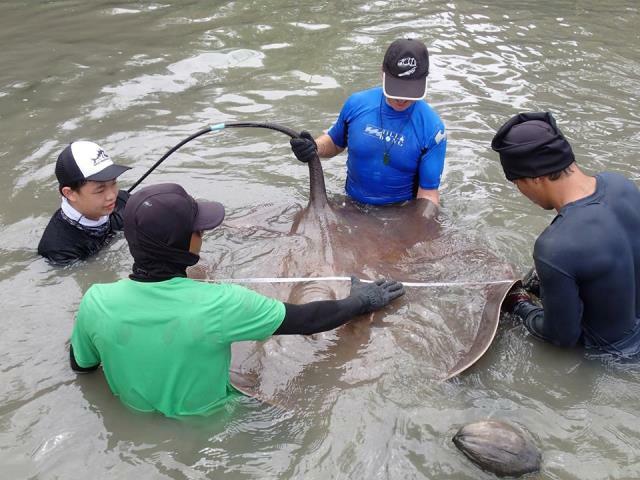 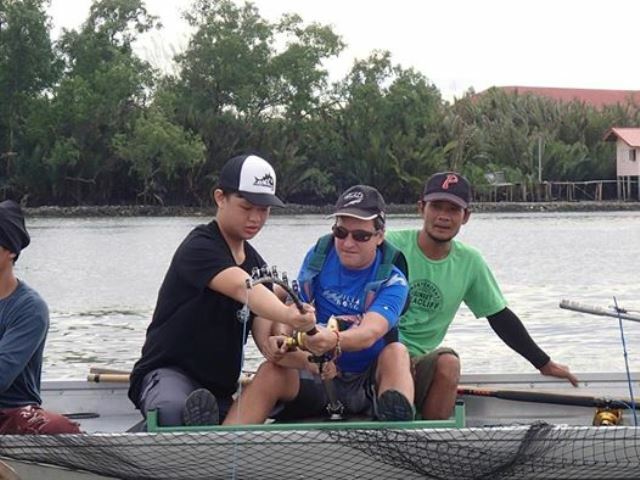 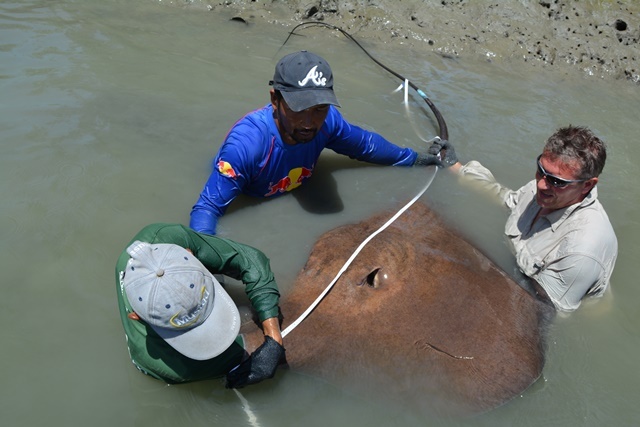 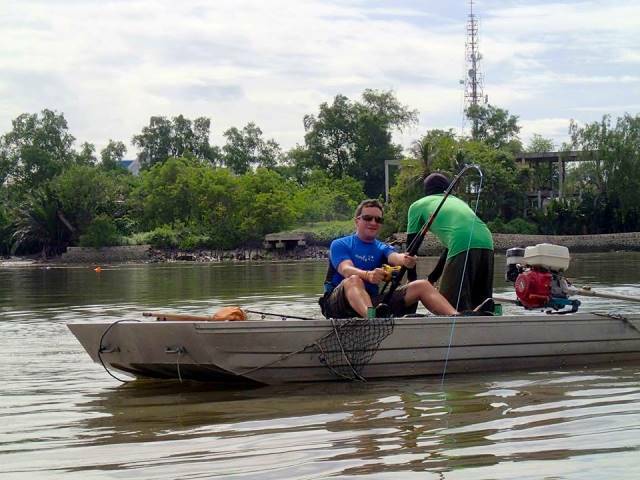 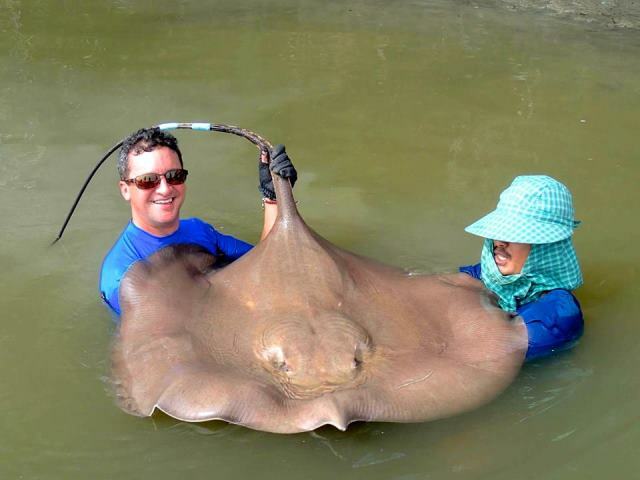 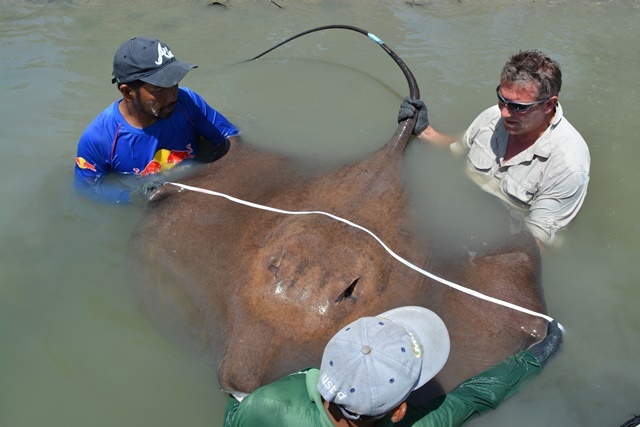 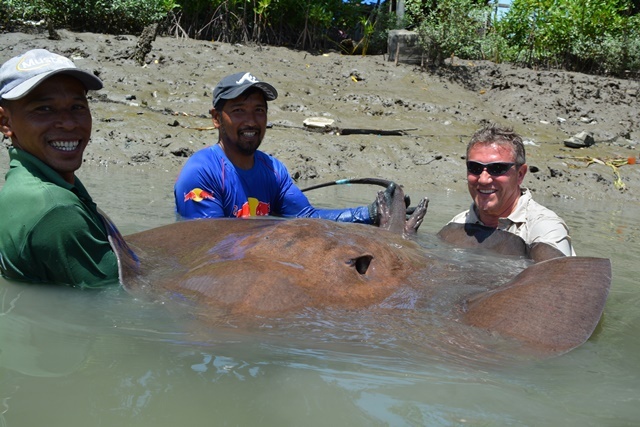 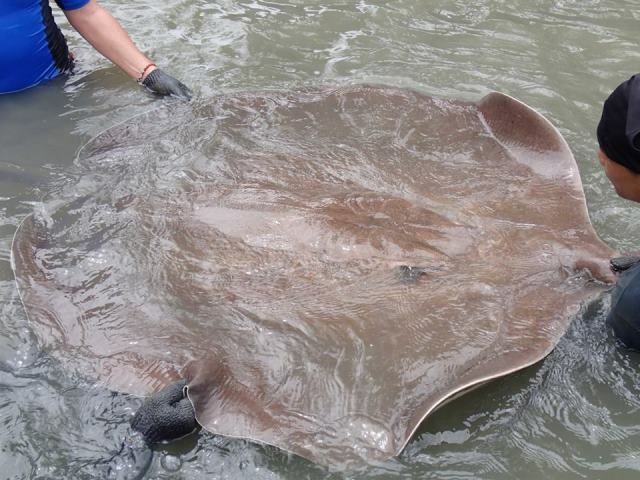 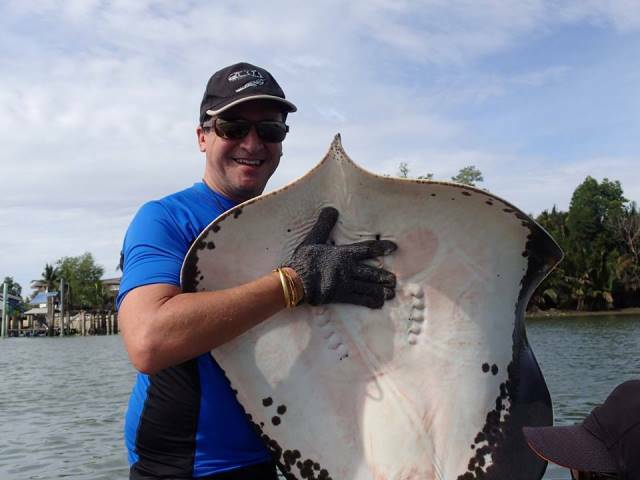 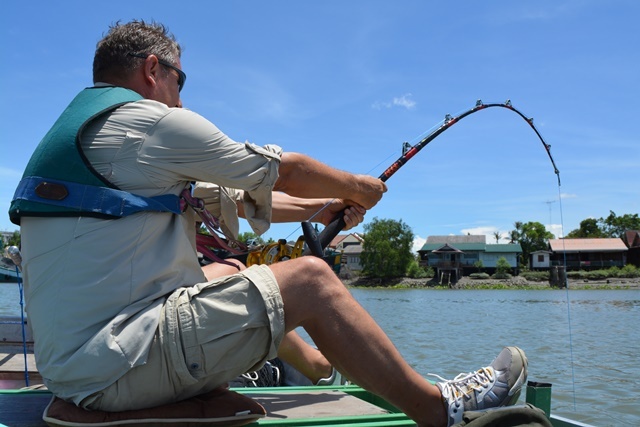 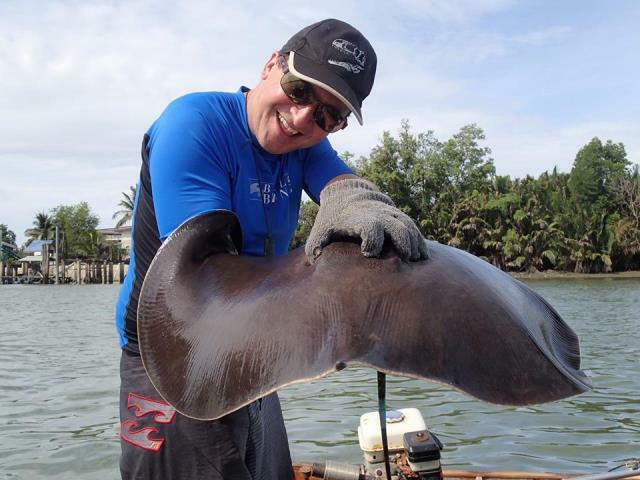 Benny successfully took Paul Austin giant freshwater stingray fishing on the Mae Klong river taking our run of trips with a 100% catch rate to four months in a row. 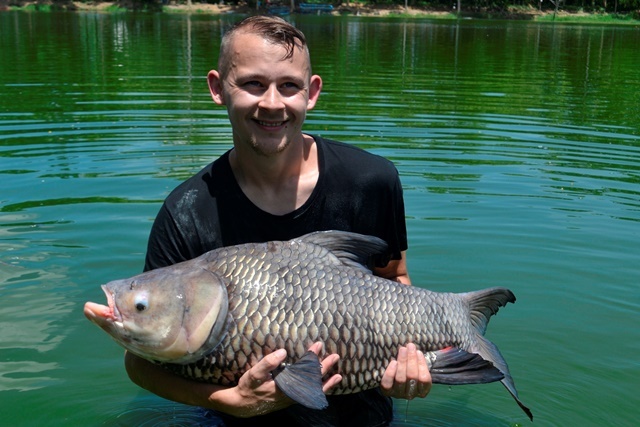 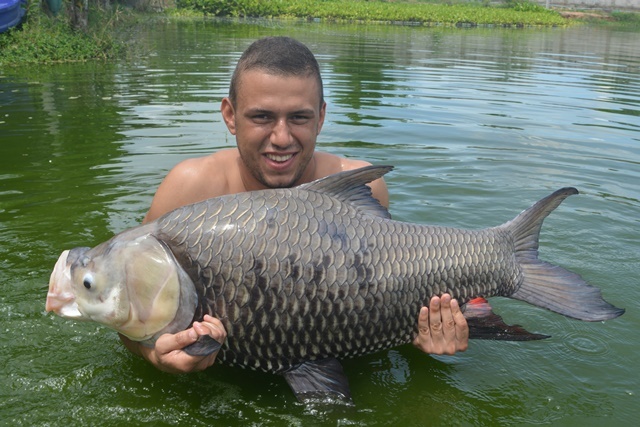 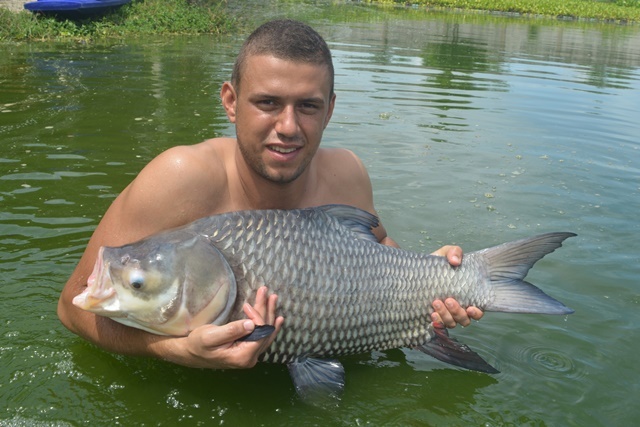 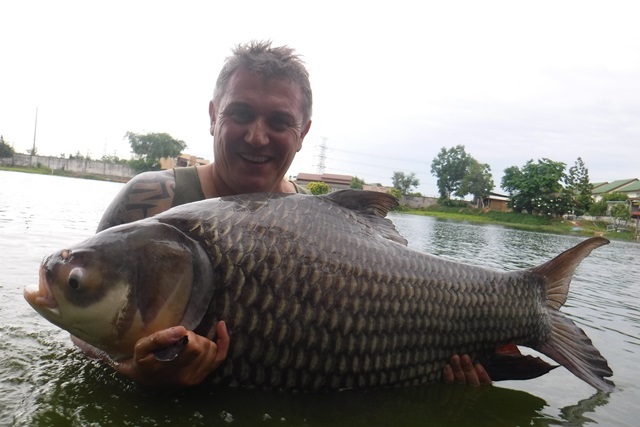 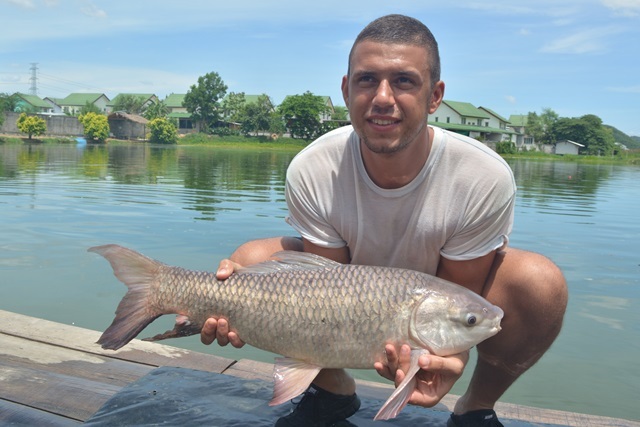 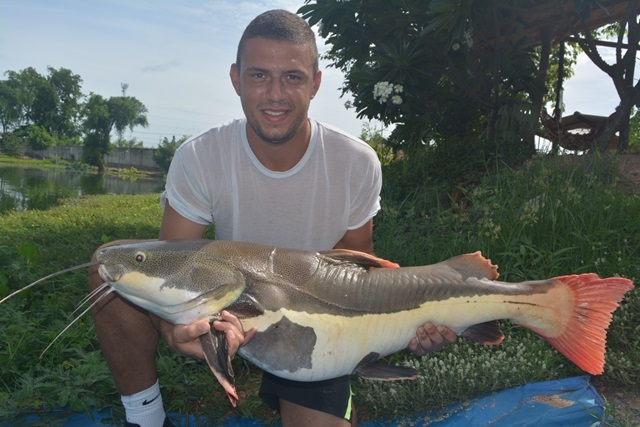 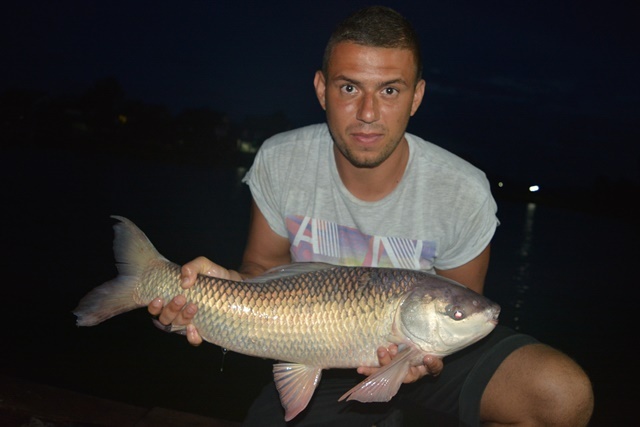 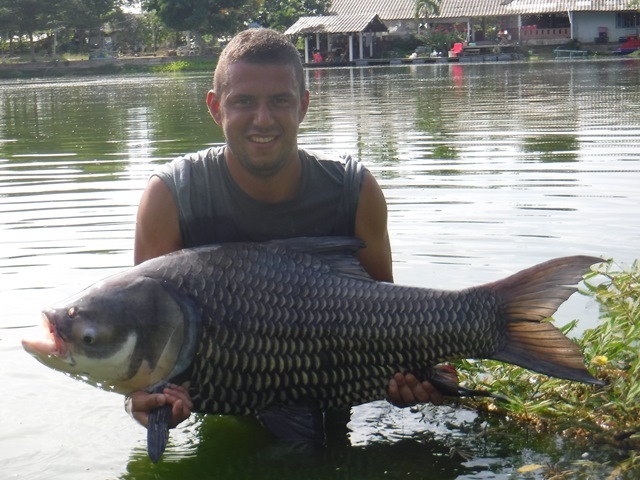 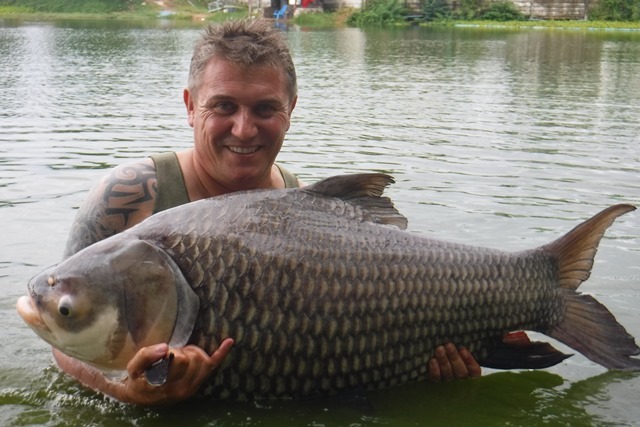 Nathan Samuels returned and this time had a much better result catching Siamese carp, albino pacu, rohu, big-Y catfish, Mekong catfish and both Thai and Amazon redtails. 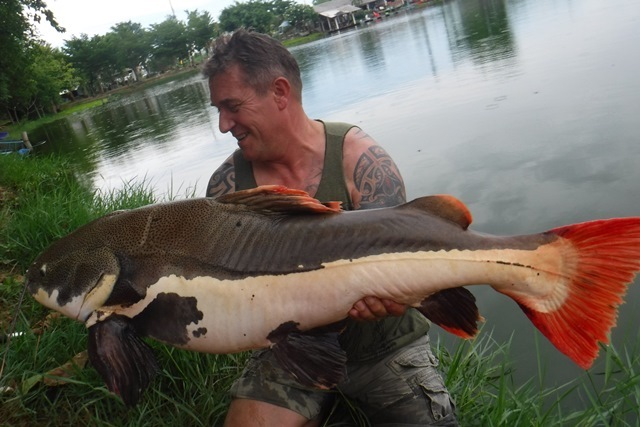 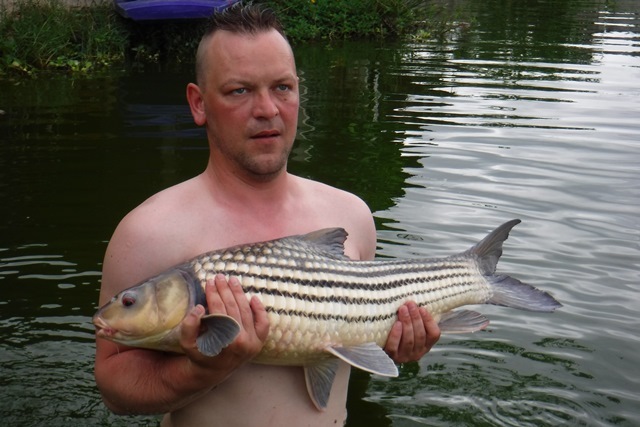 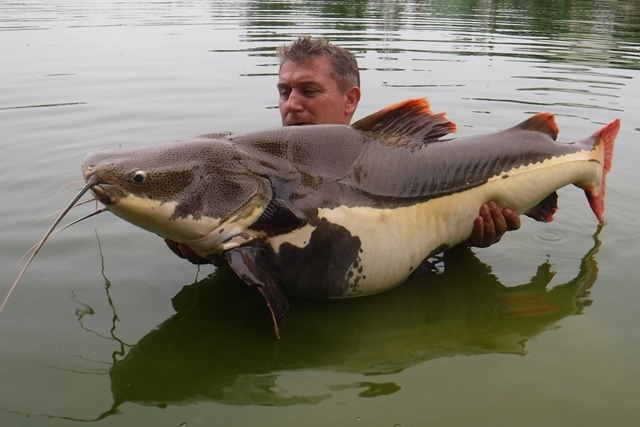 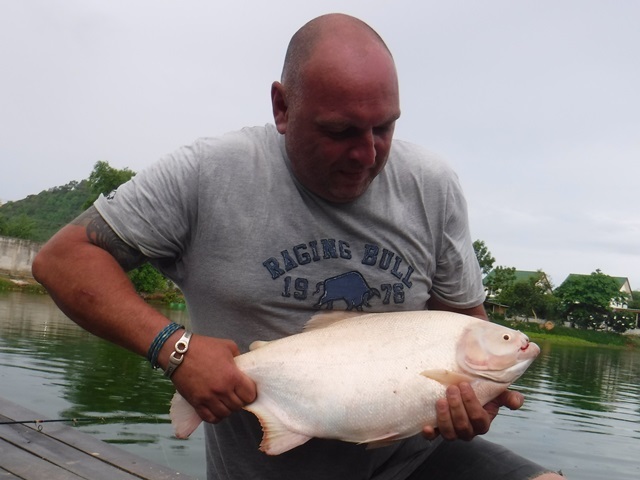 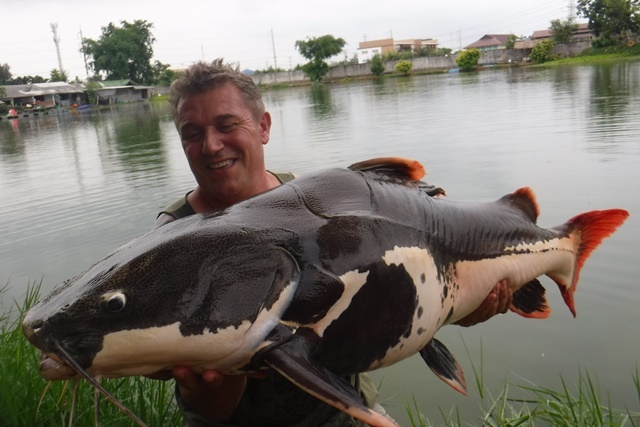 Paul Austin had a very active session catching a number of Amazon redtails as well as Siamese carp, Thai redtailed catfish, and two new species for him giant featherback and mollycot catfish. 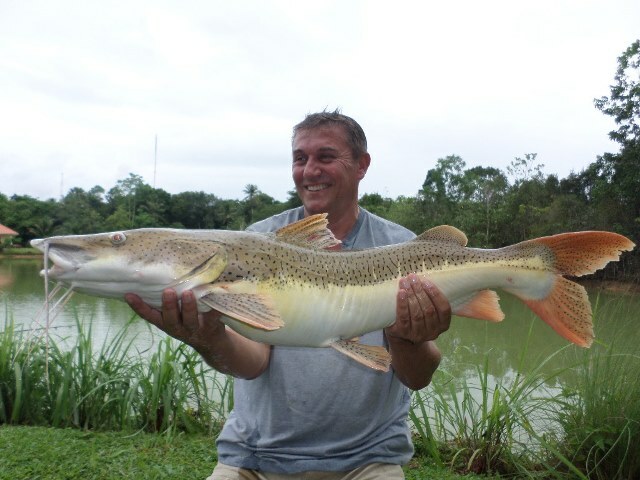 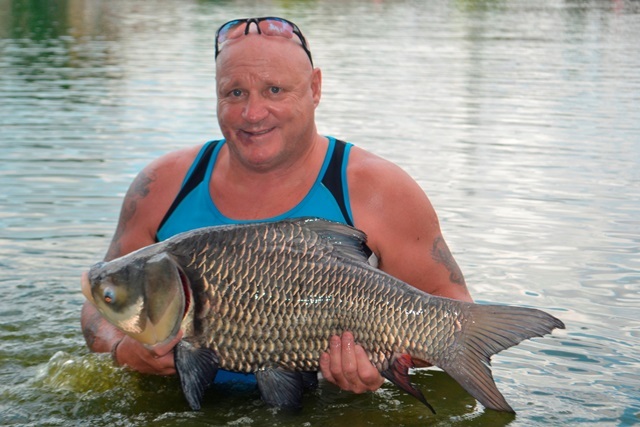 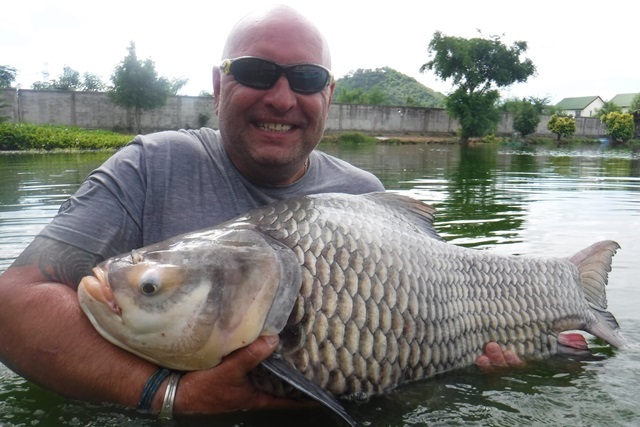 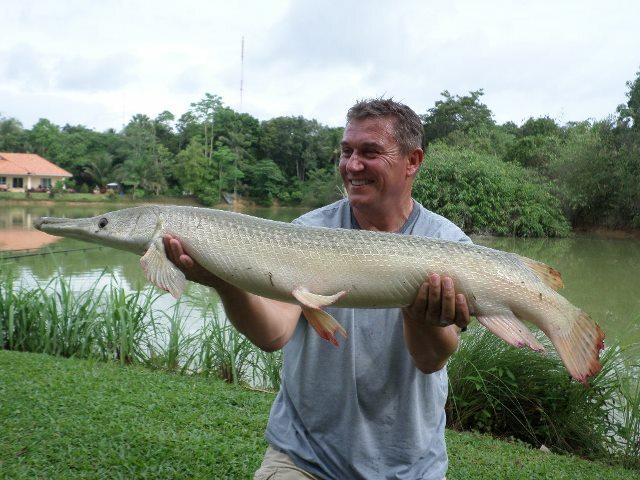 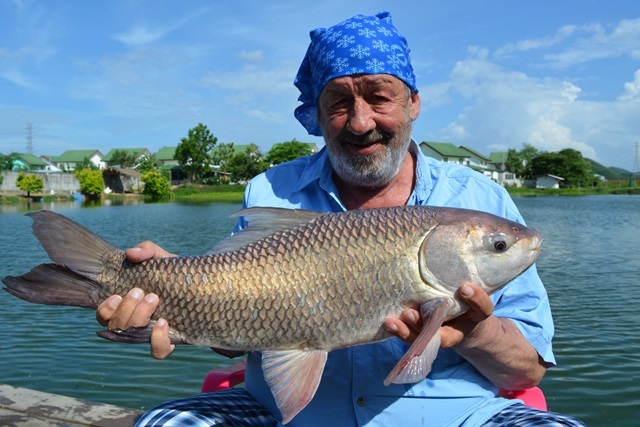 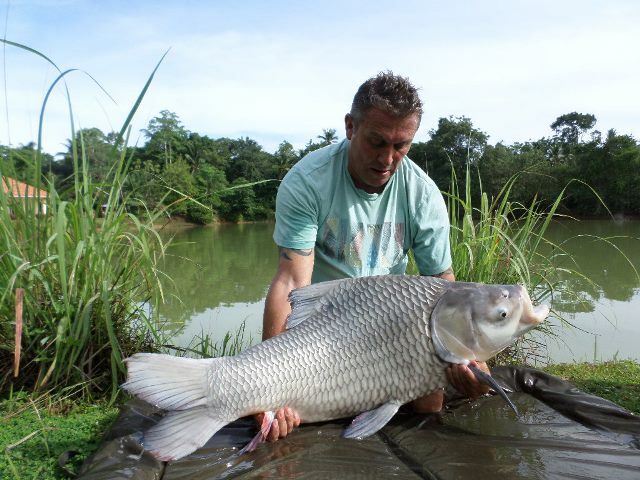 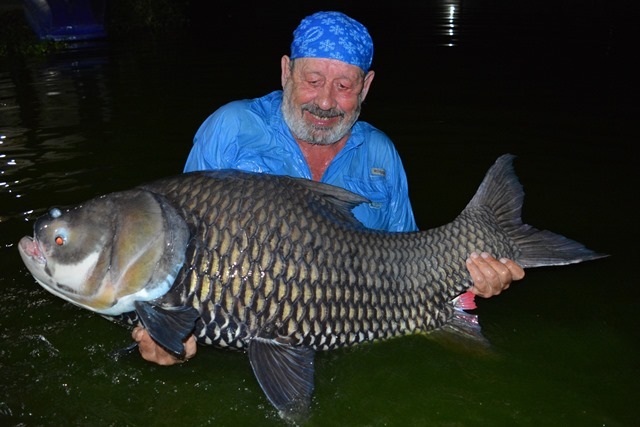 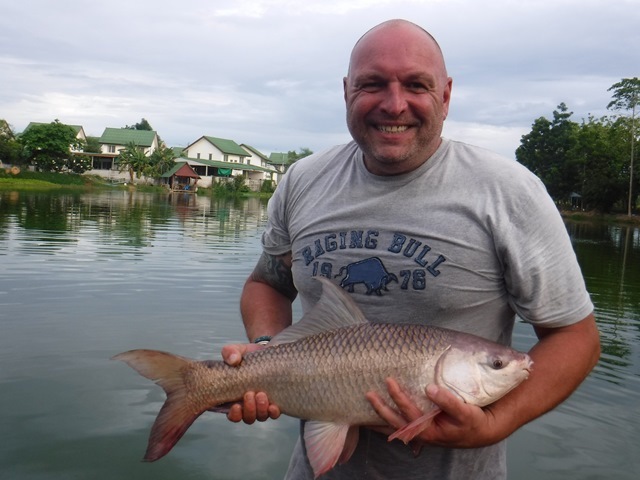 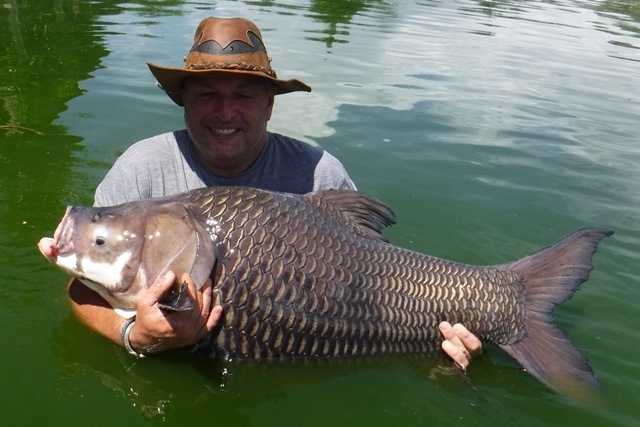 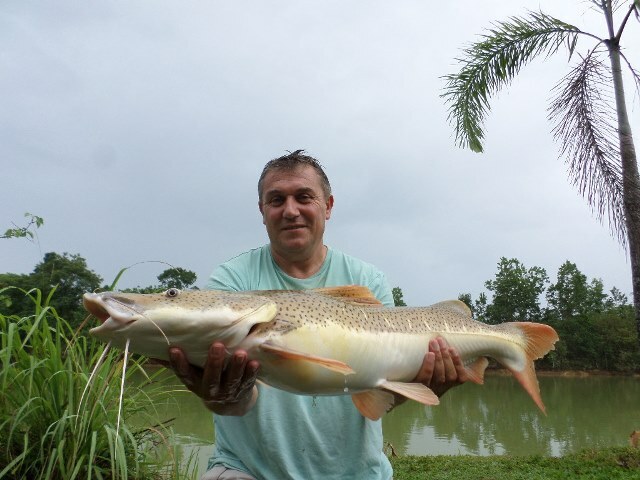 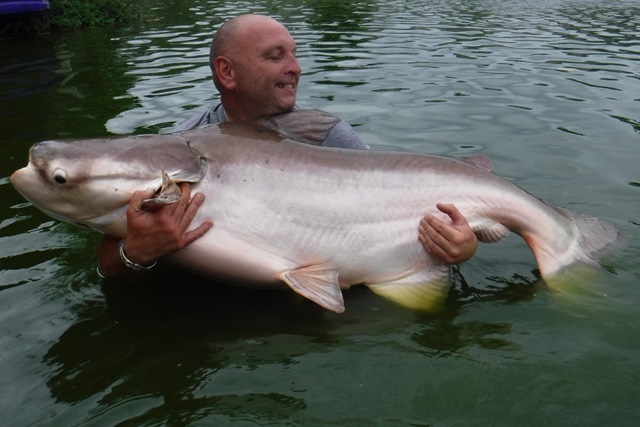 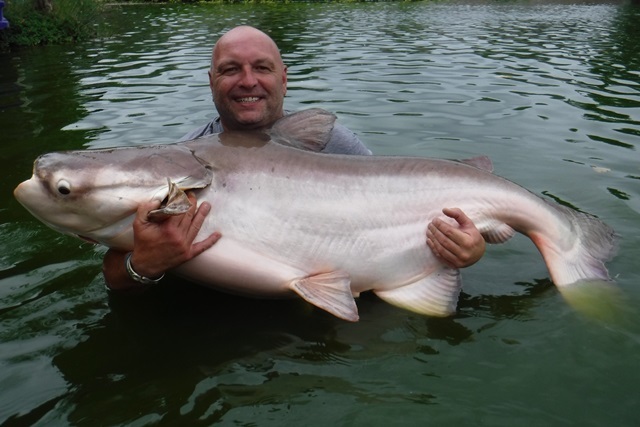 Gary Sweetman was another angler who enjoyed his first session at Palm Tree catching a number of great fish that included Siamese carp, alligator gar, Mekong catfsih, albino Pacu, rohu, leopard catfish as well as both Amazon and Thai redtails. 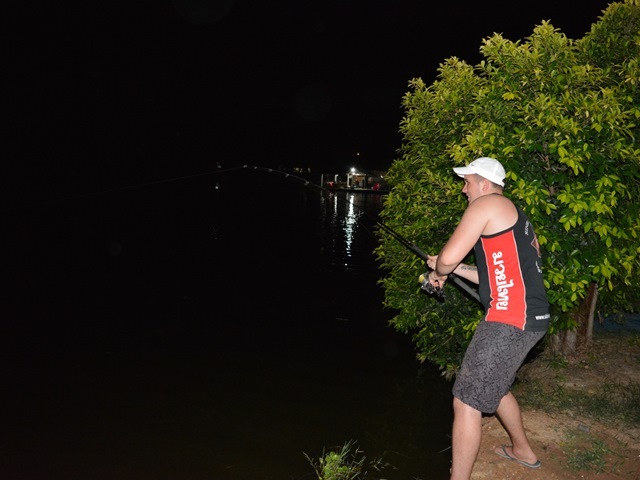 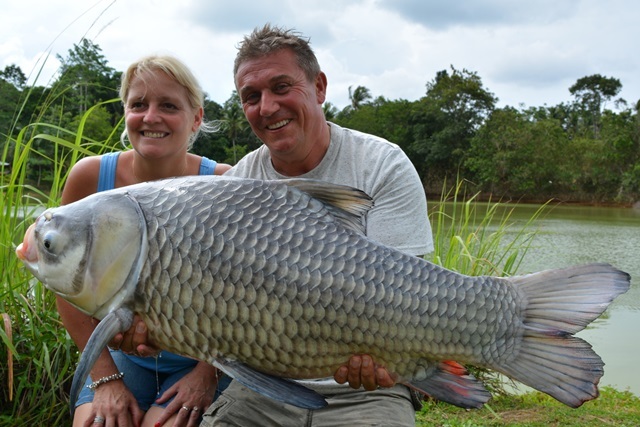 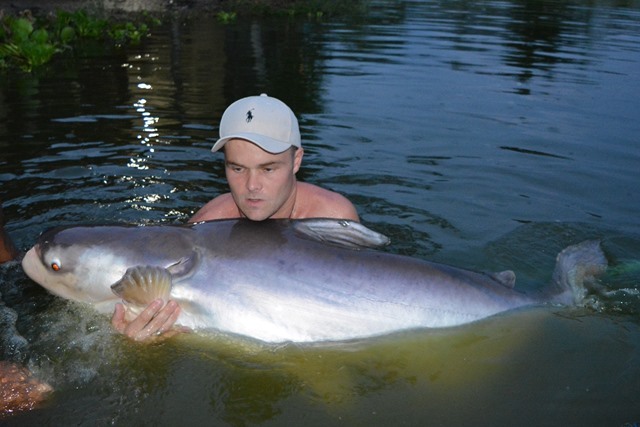 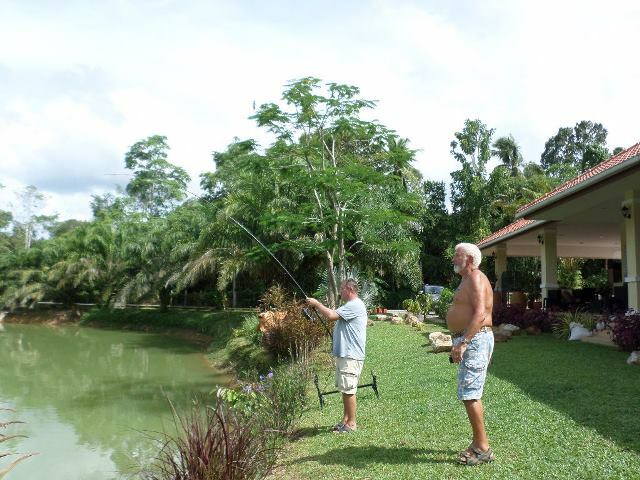 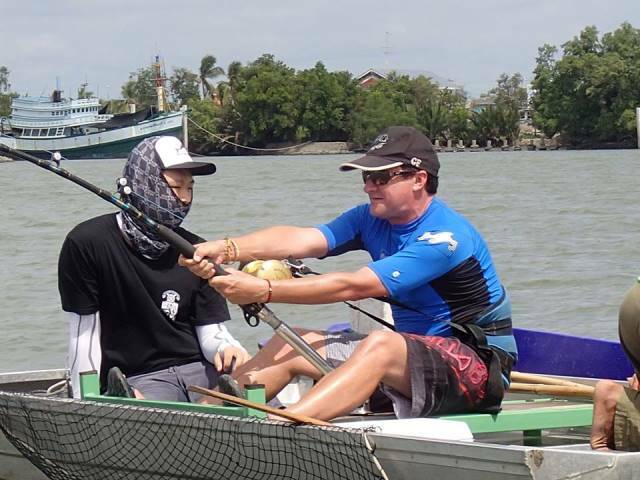 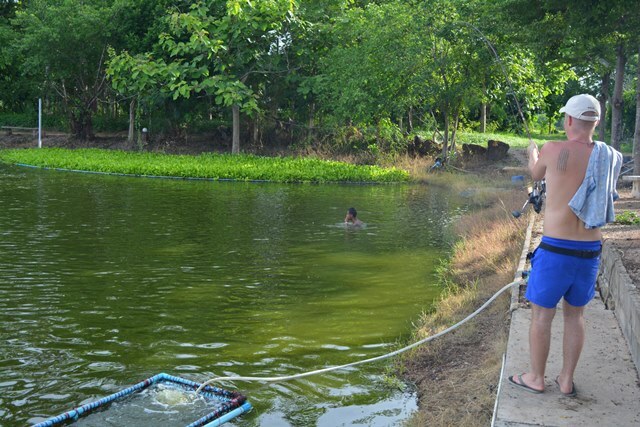 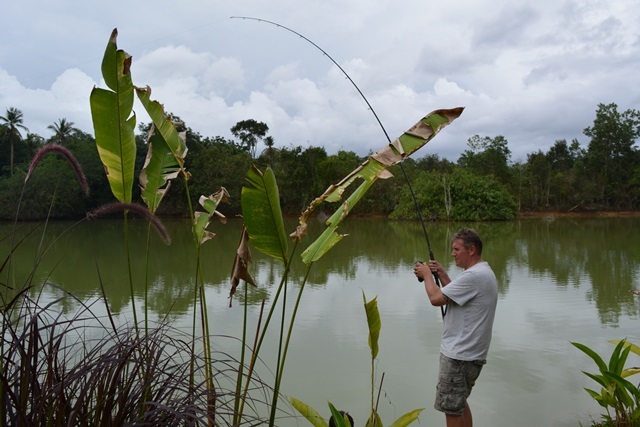 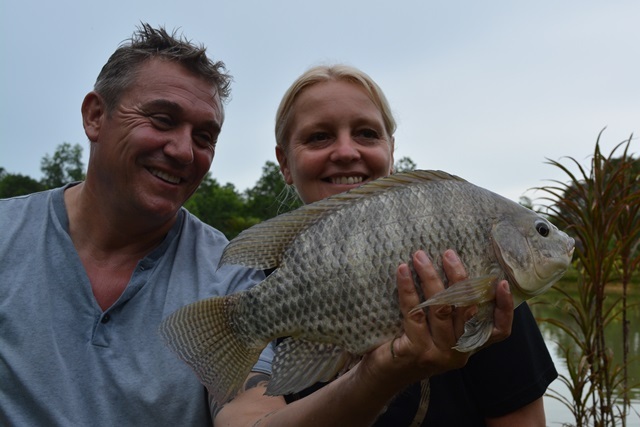 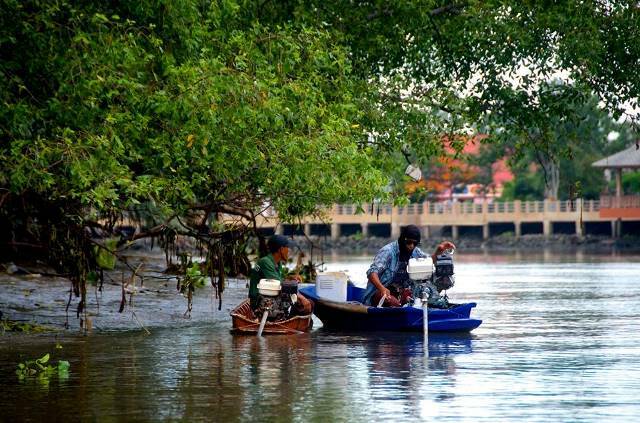 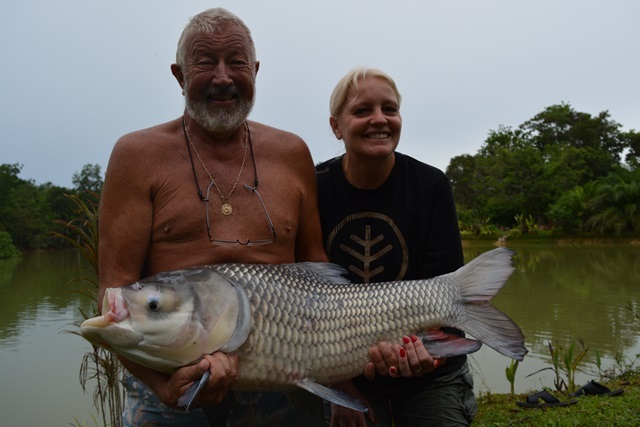 Paul Austin and his wife Ange went down with Benny to fish John Wilson's private lake 'Bung Sawan' in Chumphon. 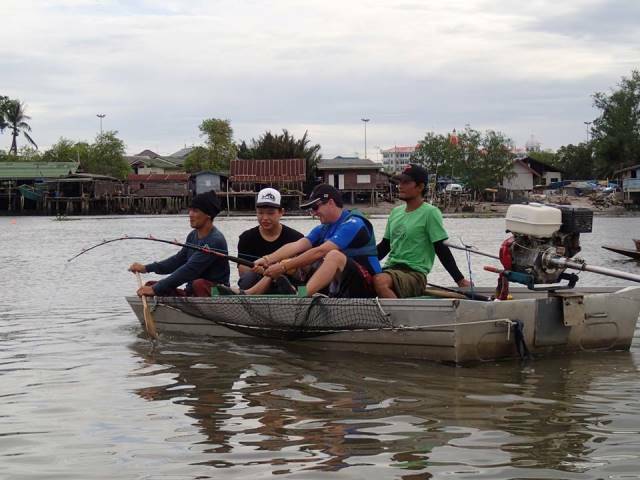 They had a great time catching a good selection of fish that included Siamese carp, alligator gar, Amazon redtail, leopard catfish, Java barb and tilapia. 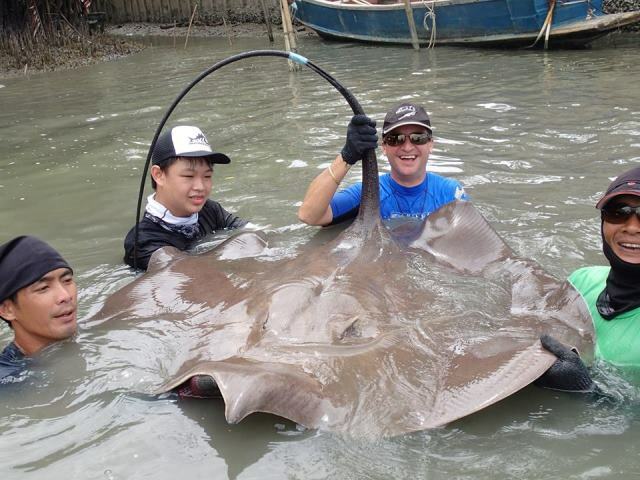 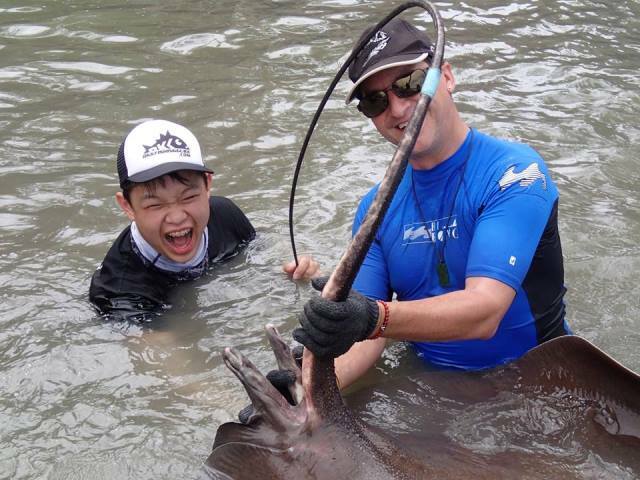 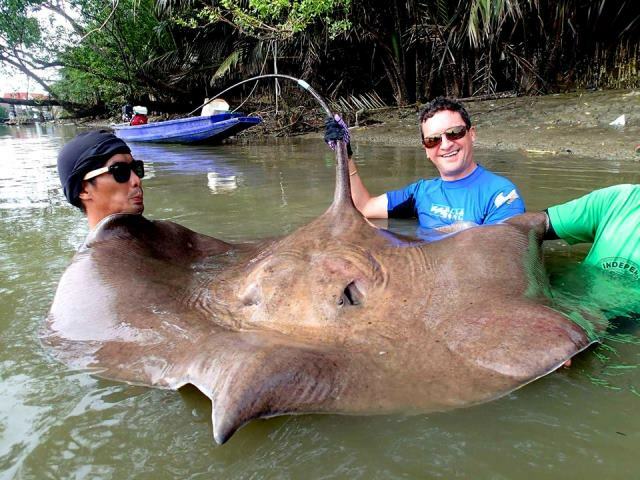 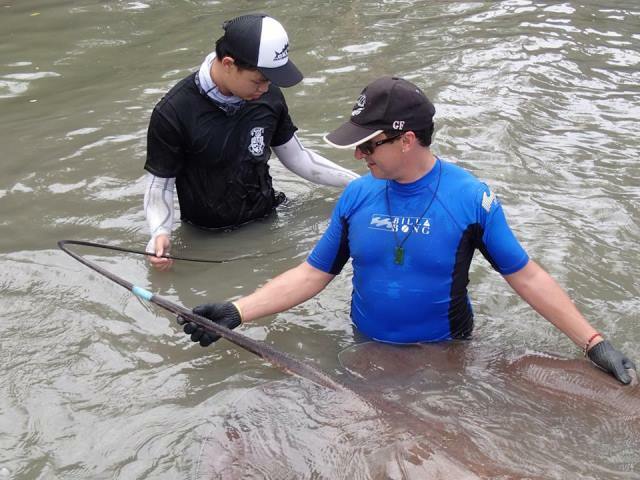 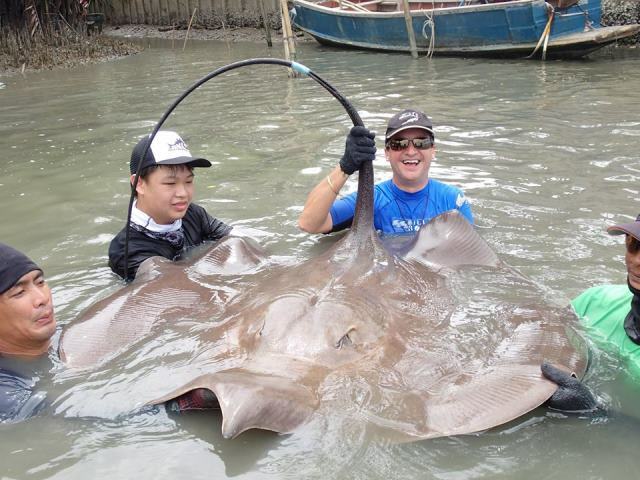 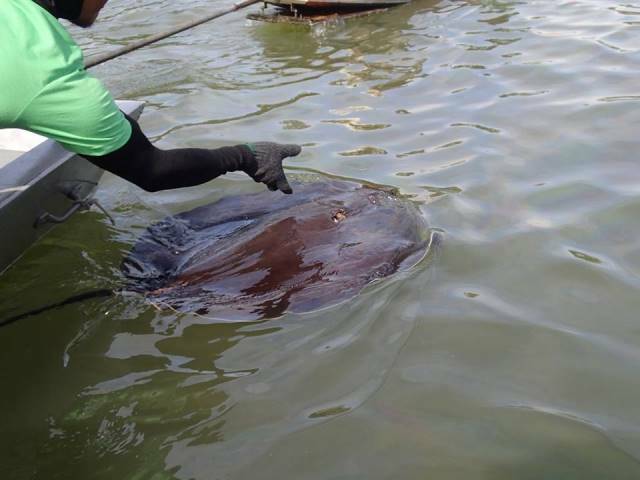 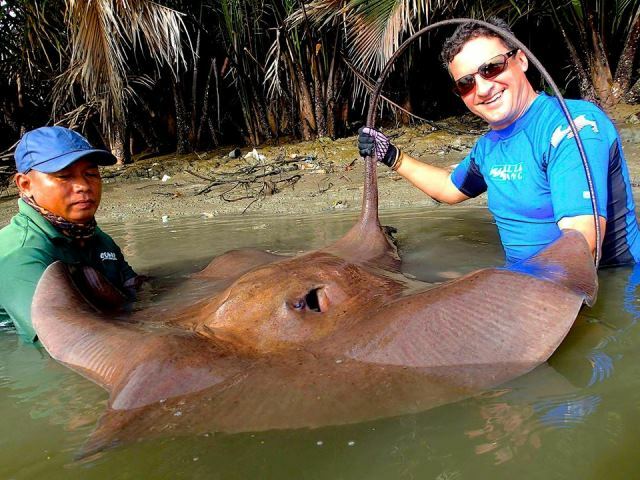 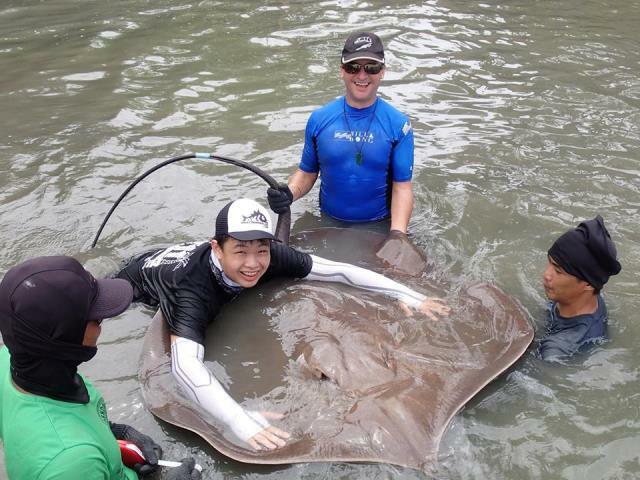 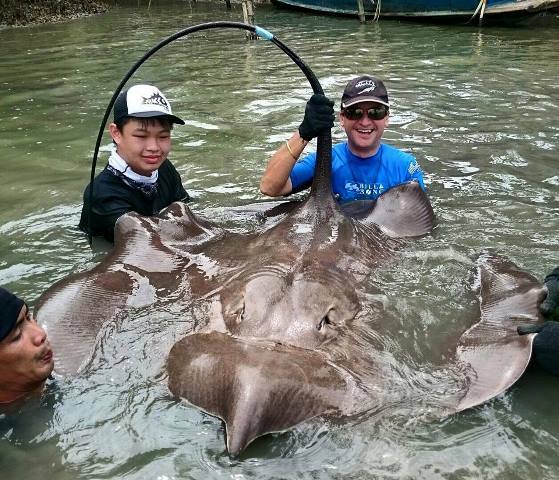 Tap of Bangkok Fishing Guide Service took regular customer Cristofre Martin giant freshwater stingray fishing on the Mae KLong river in search of a river monster to qualify him for his third Palm Tree Lagoon BIG fish club t-shirt to go with his Chao Phraya and Arapaima ones. 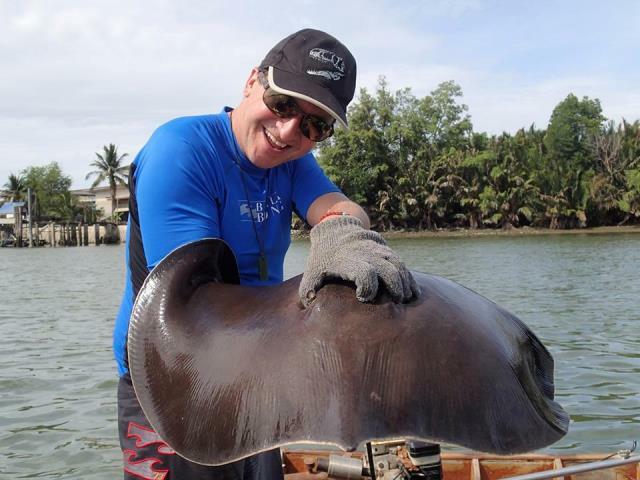 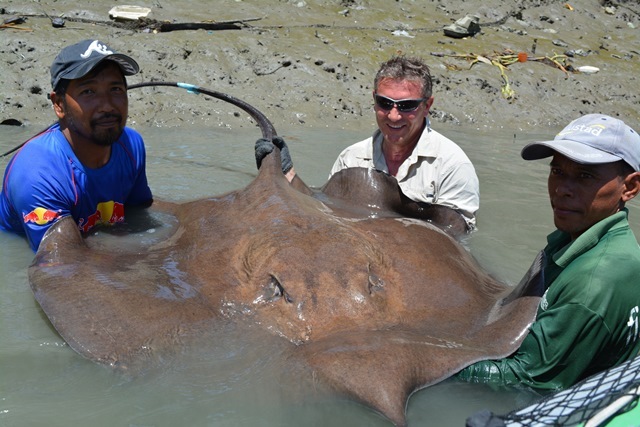 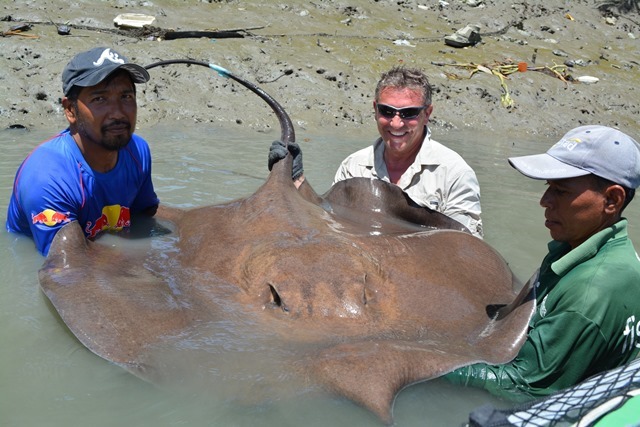 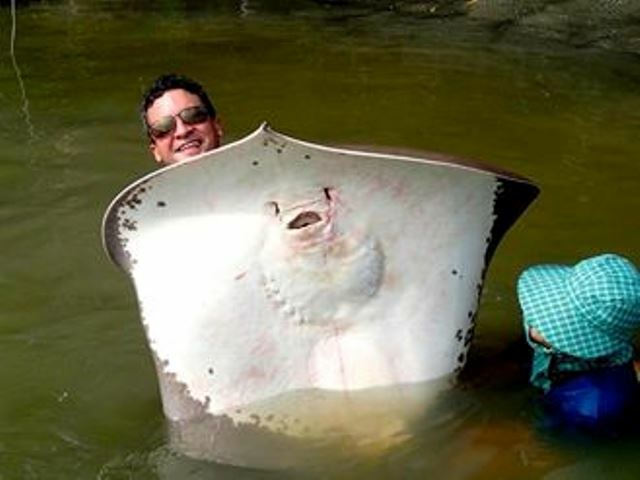 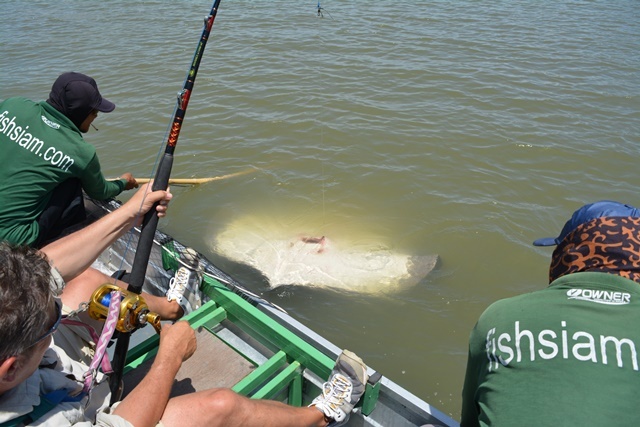 Although not successful this time he vowed to be back after catching four stingray to over 300lb, and loosing a fourth one estimated to be around the 400lb mark at the net. 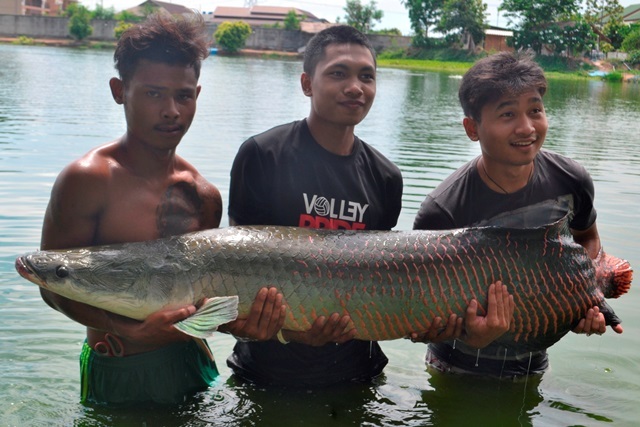 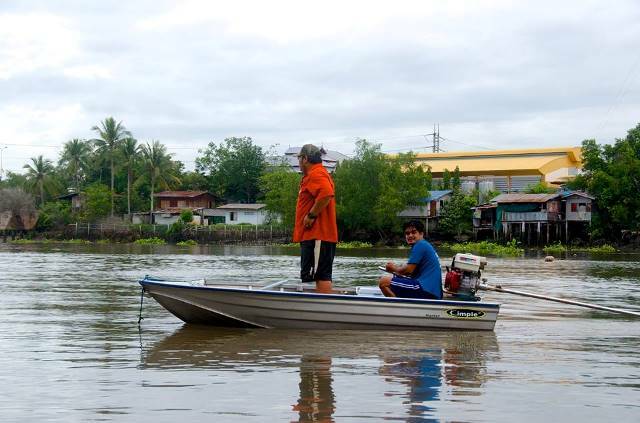 Hazwan Jamil and his brother were all smiles catching there target species of Arapaima and a stunning alligator gar. 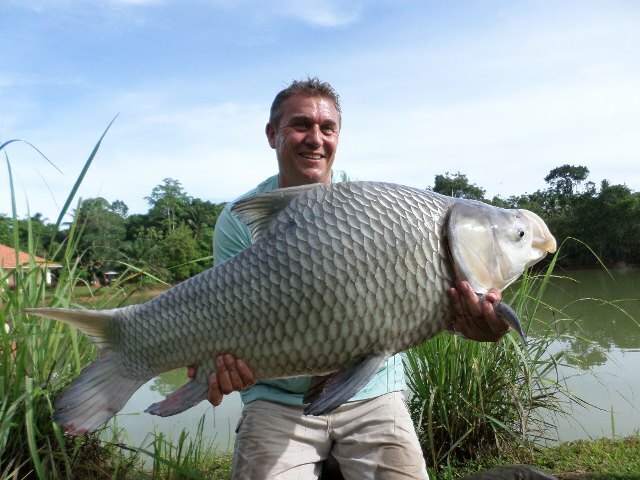 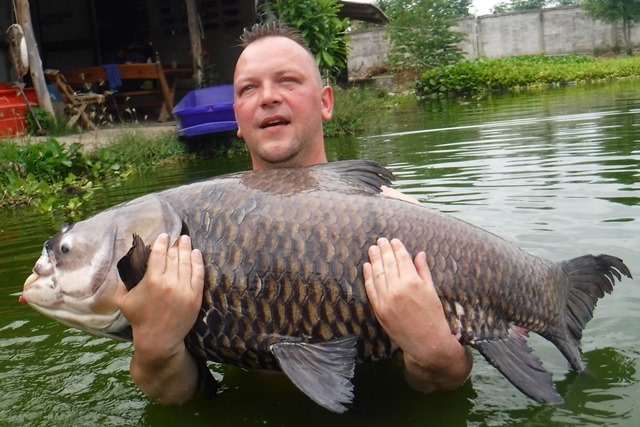 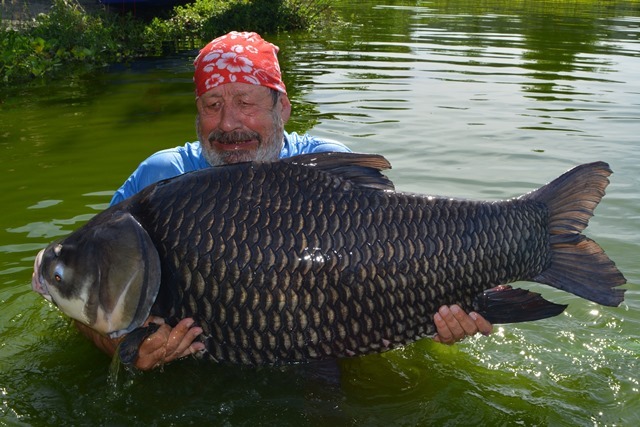 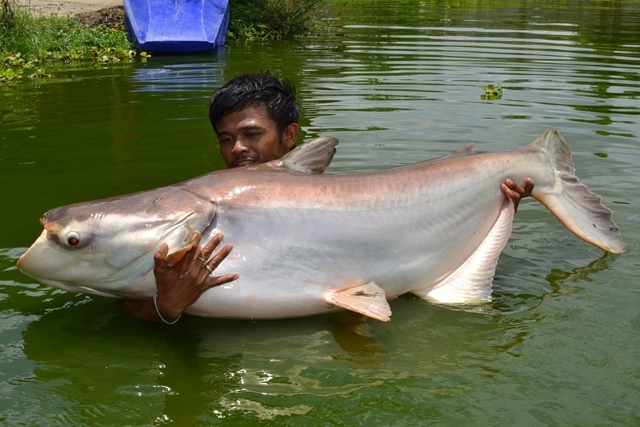 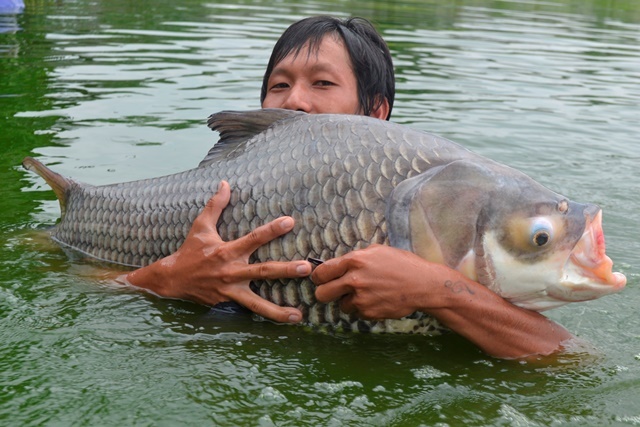 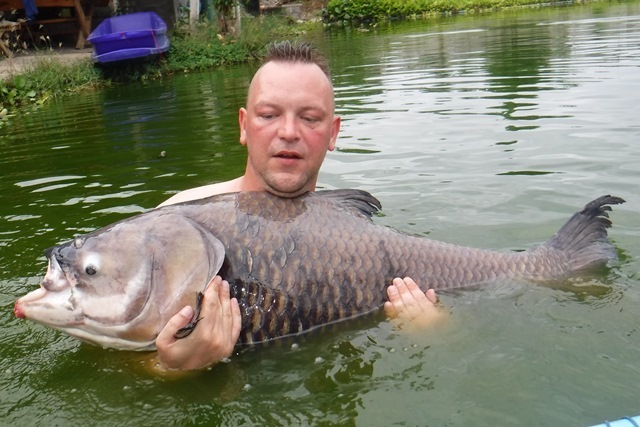 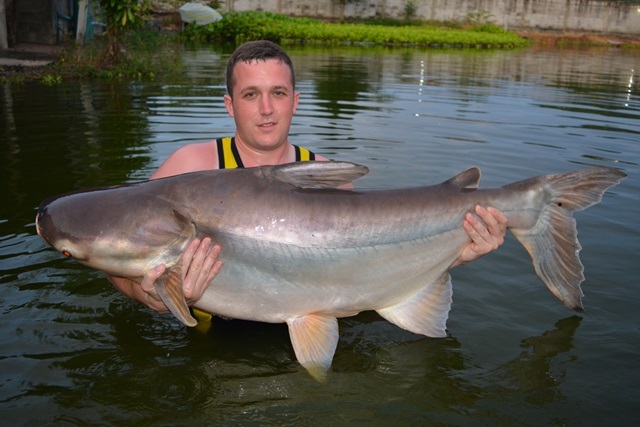 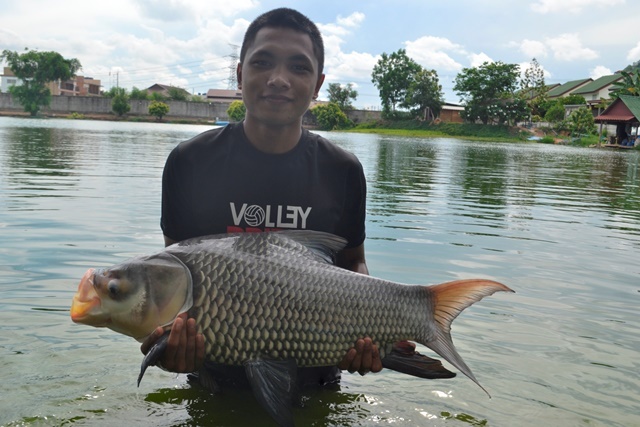 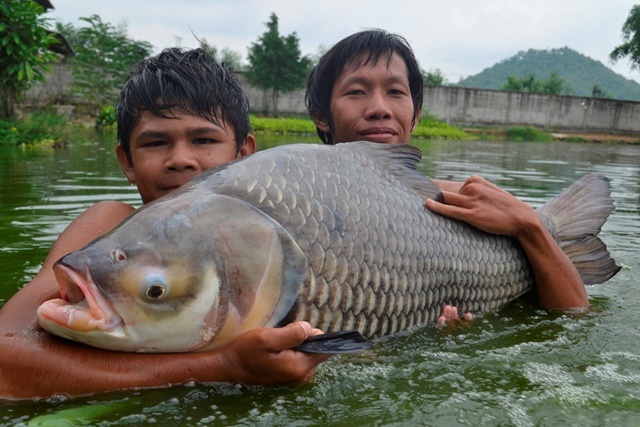 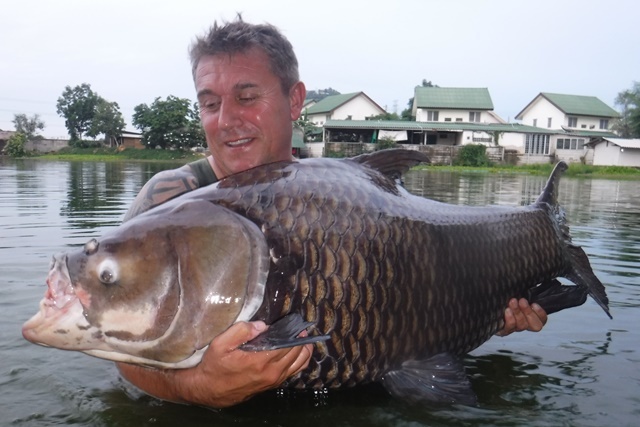 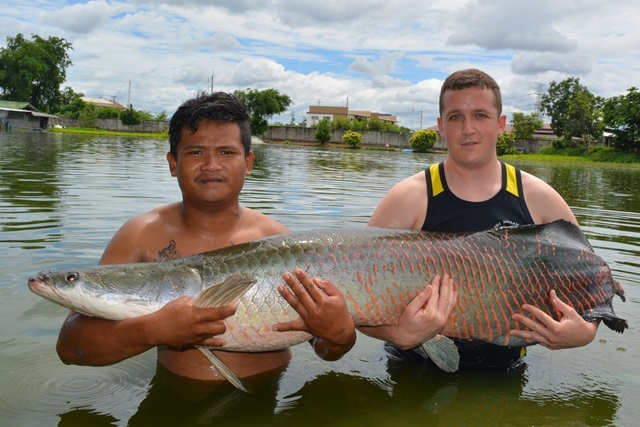 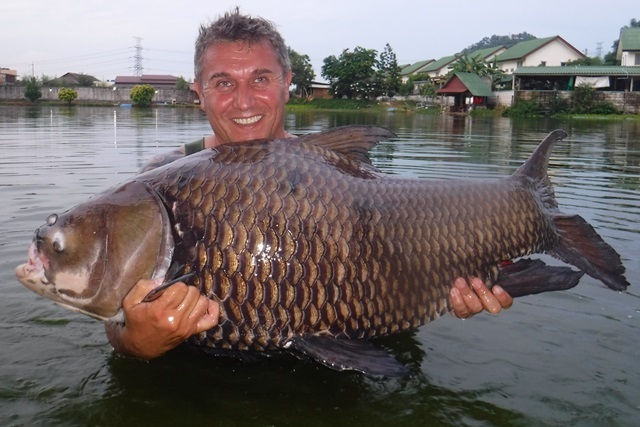 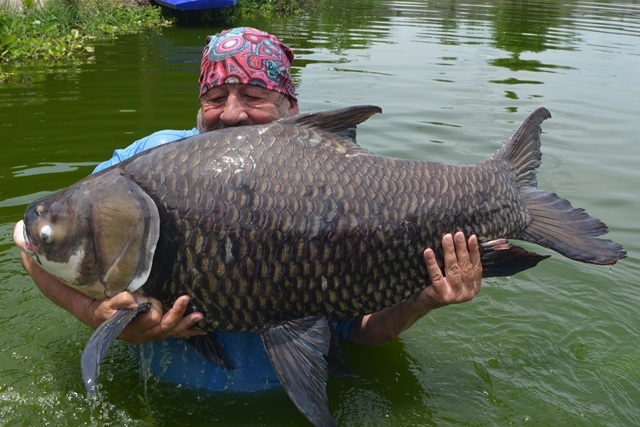 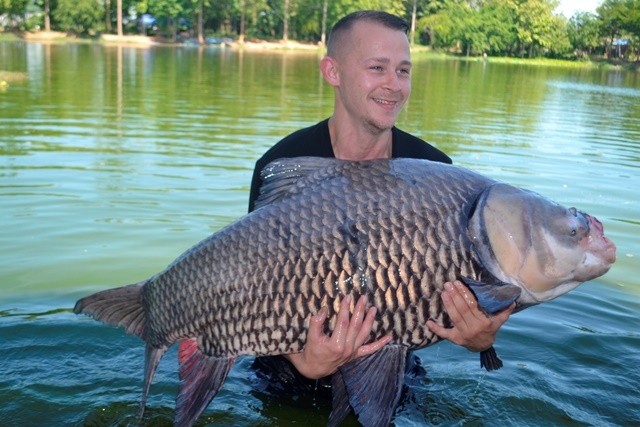 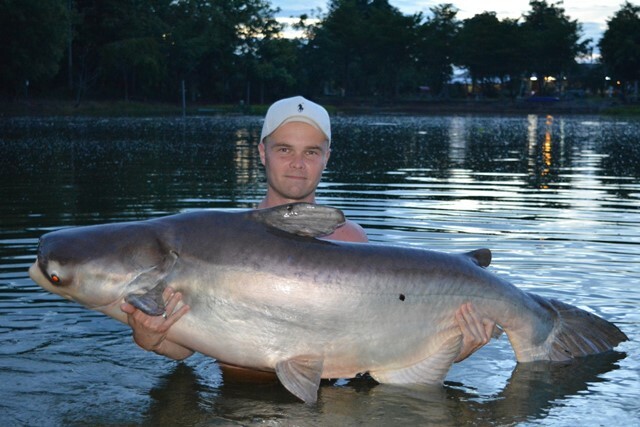 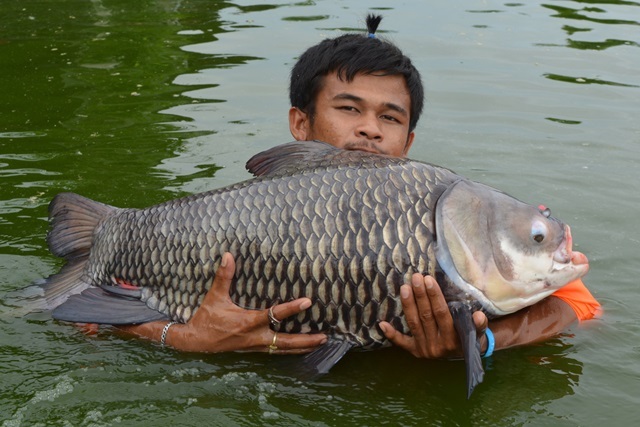 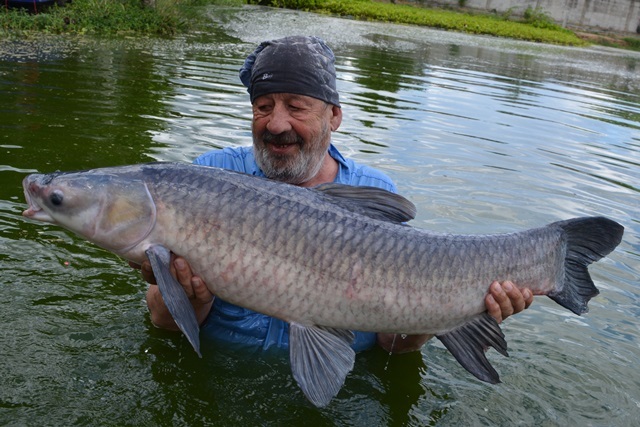 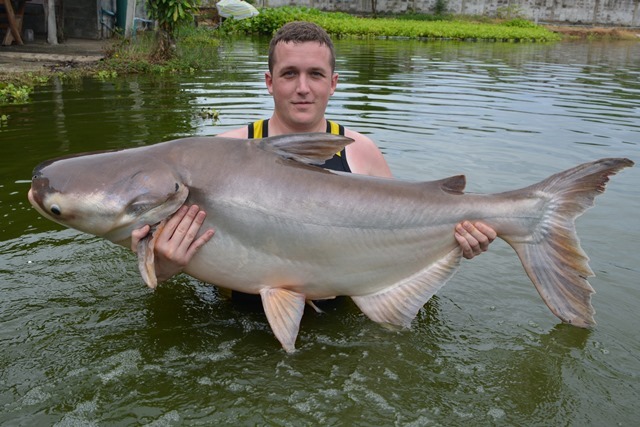 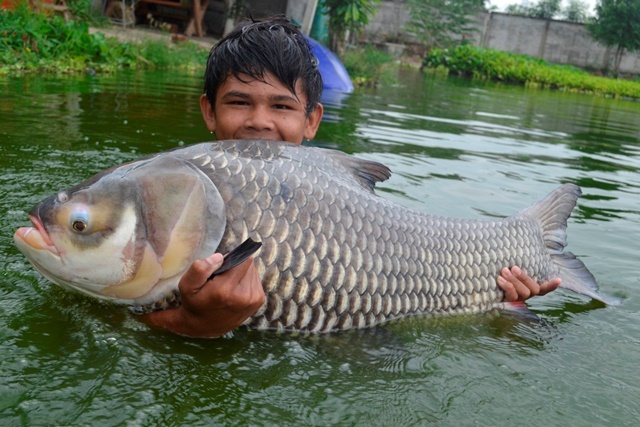 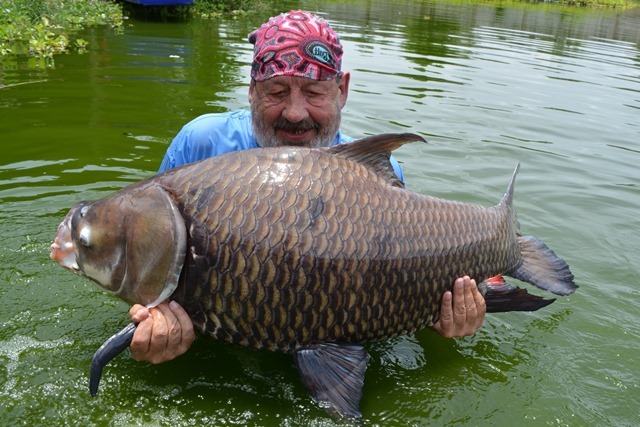 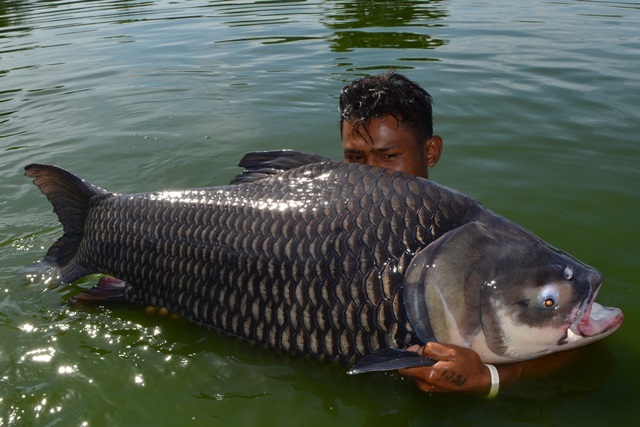 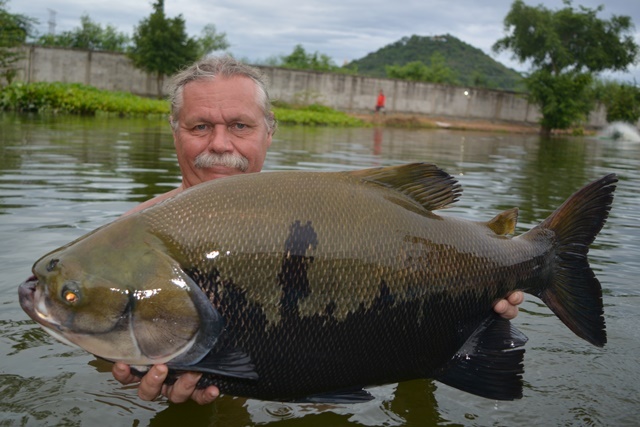 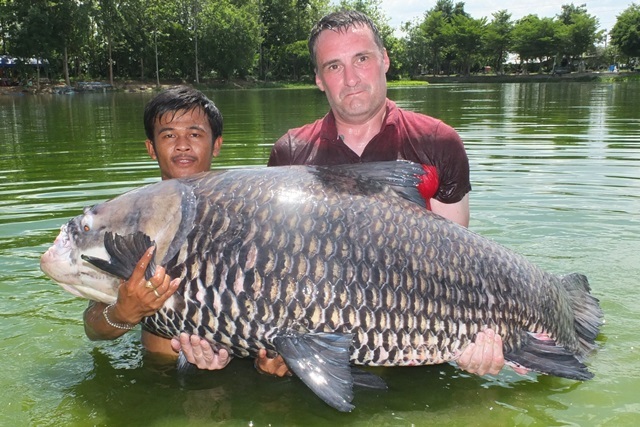 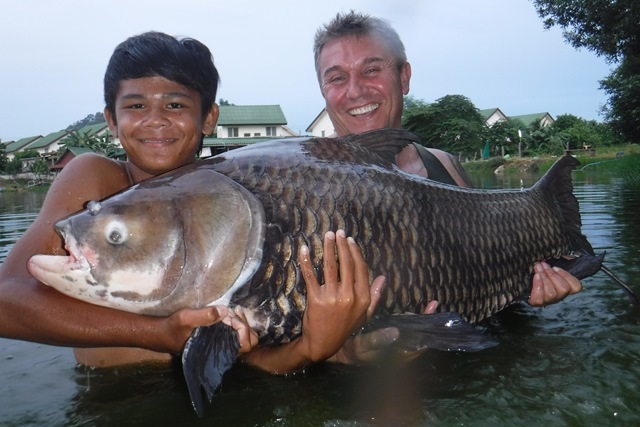 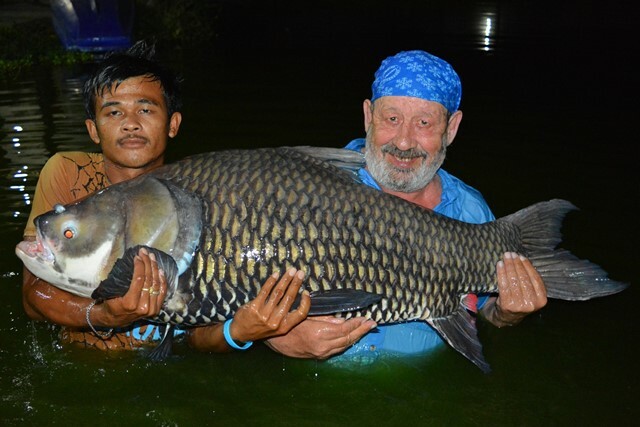 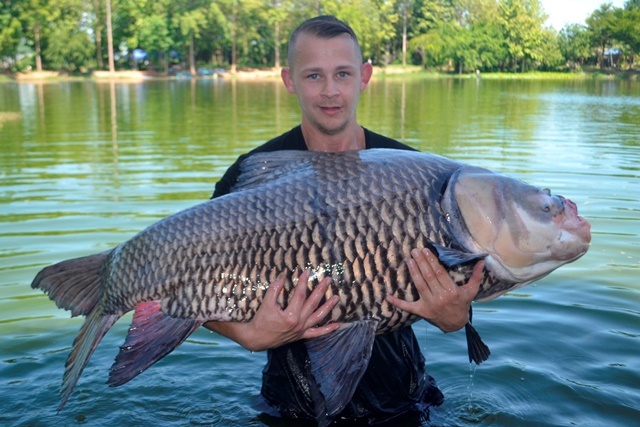 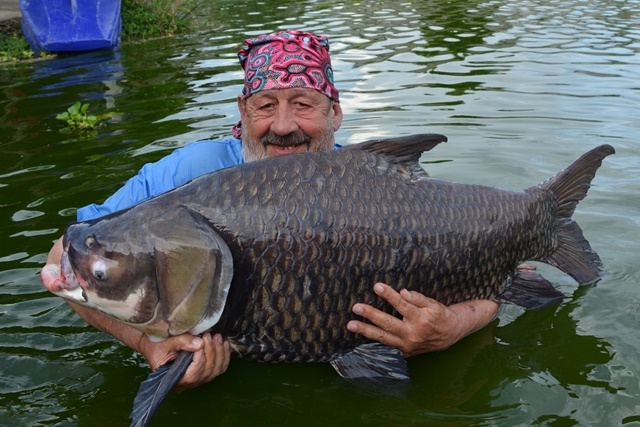 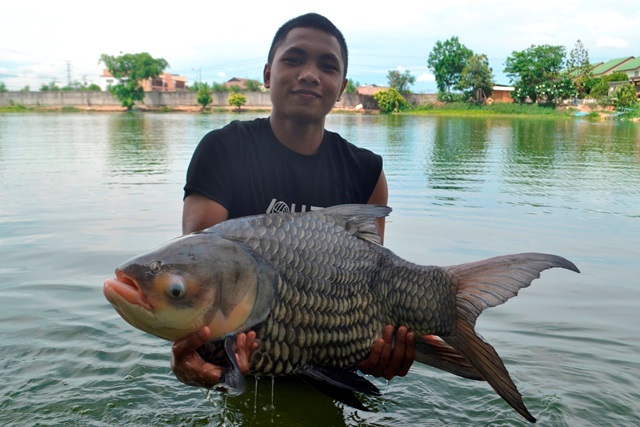 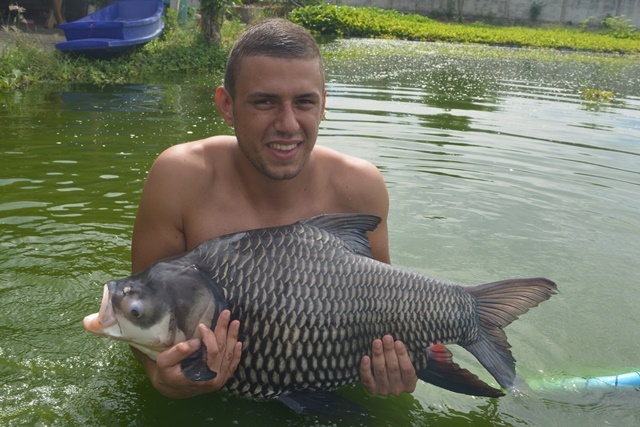 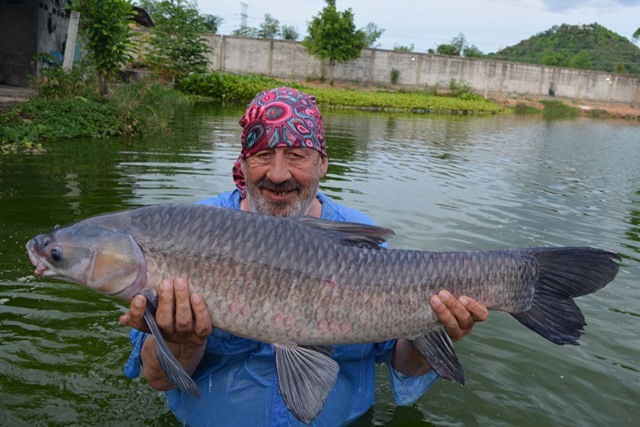 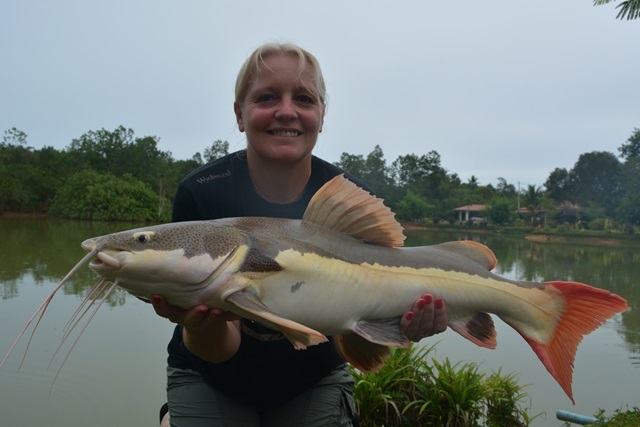 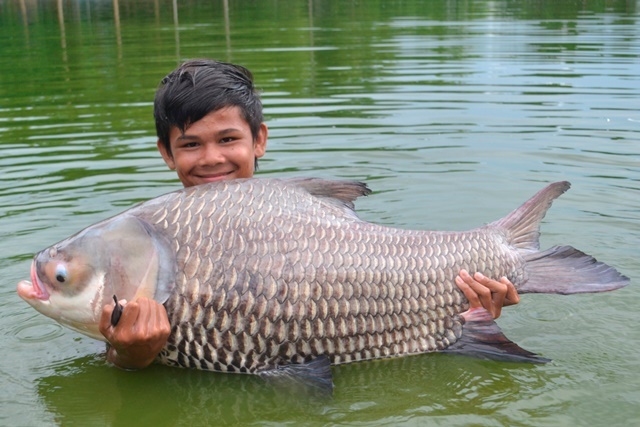 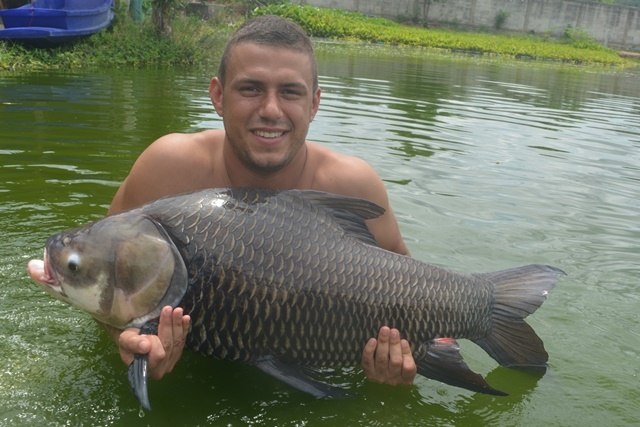 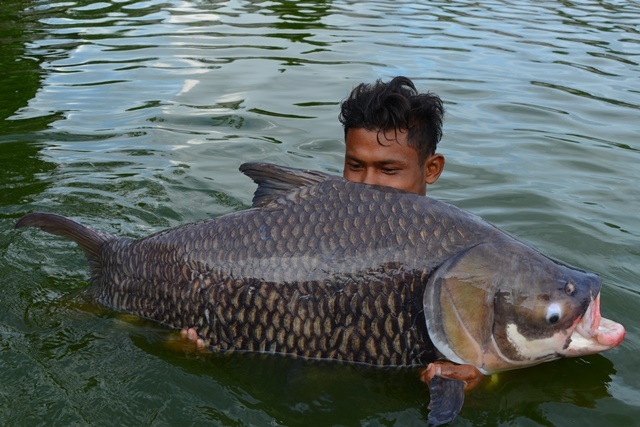 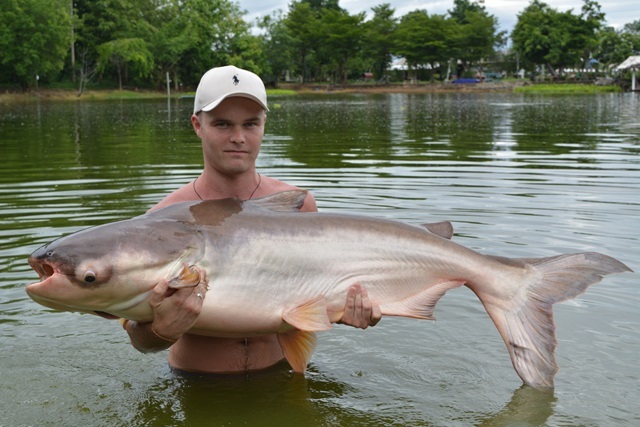 They also caught Siamese carp, Amazon redtail, Mekong catfish and striped catfish. 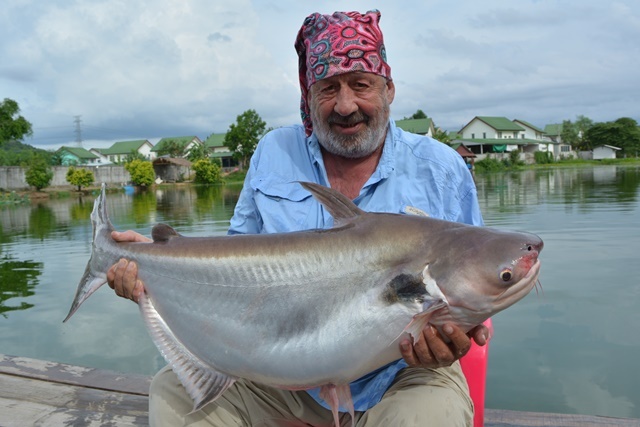 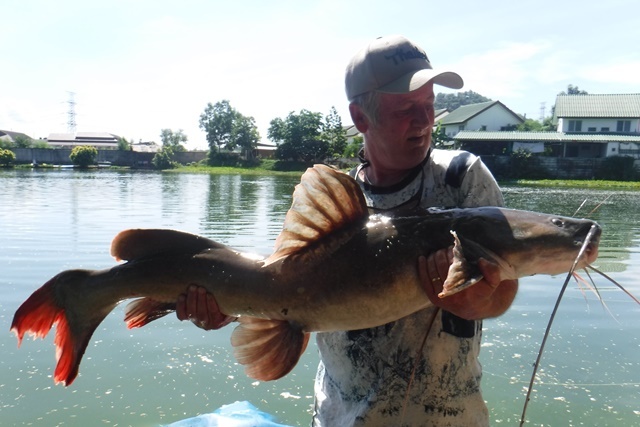 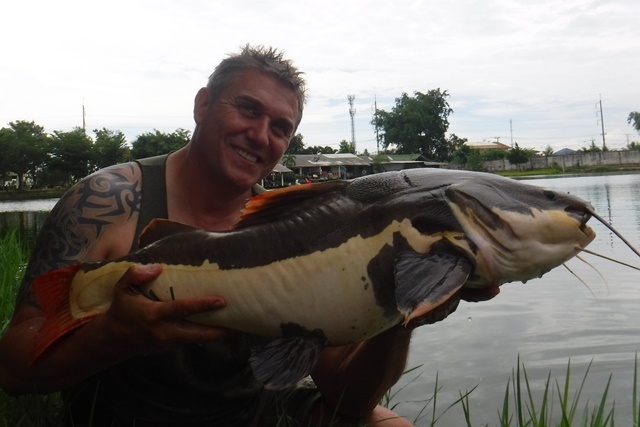 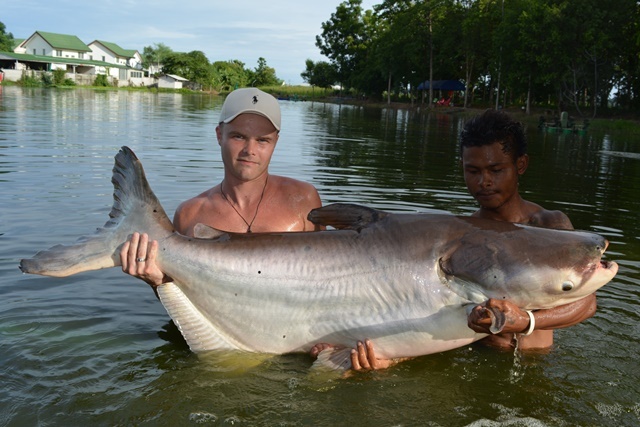 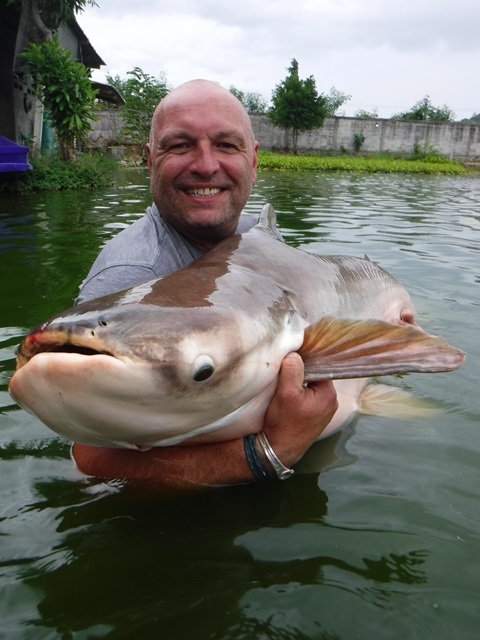 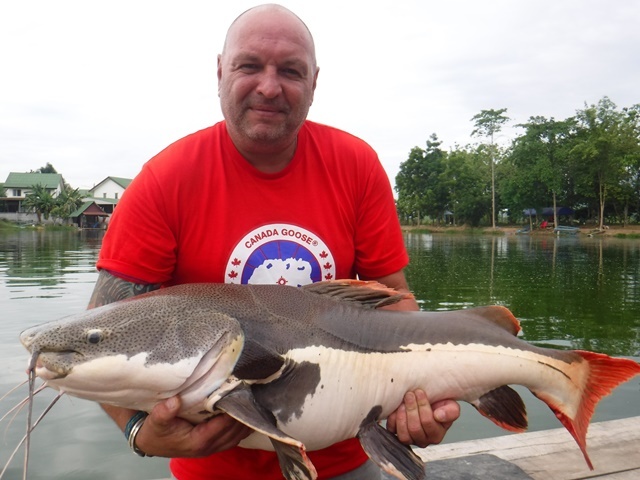 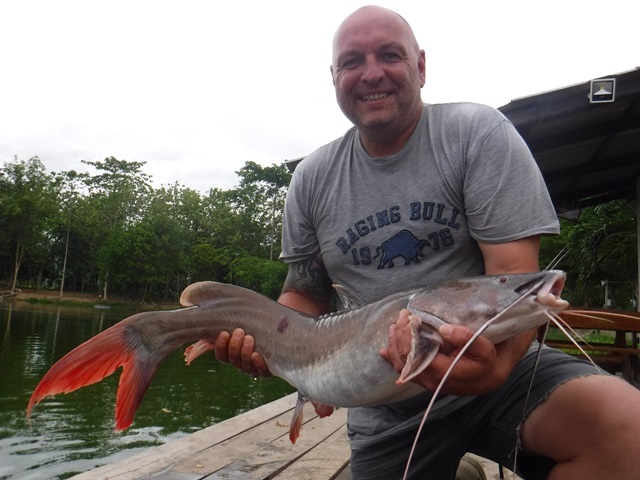 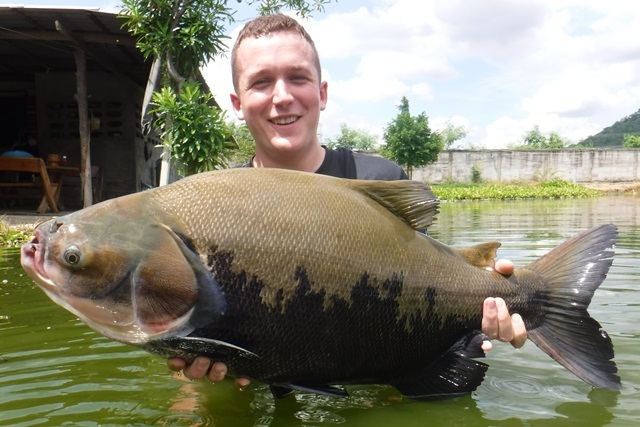 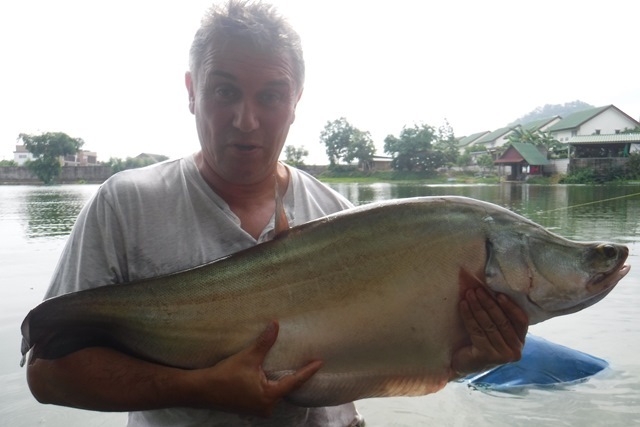 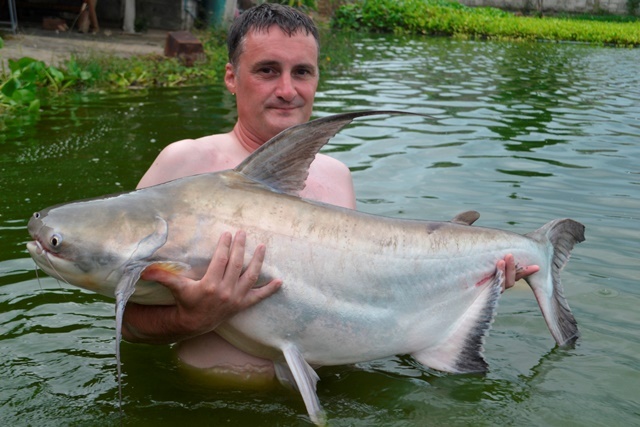 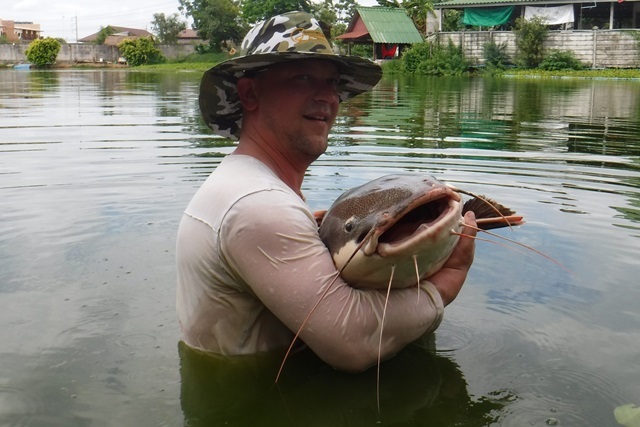 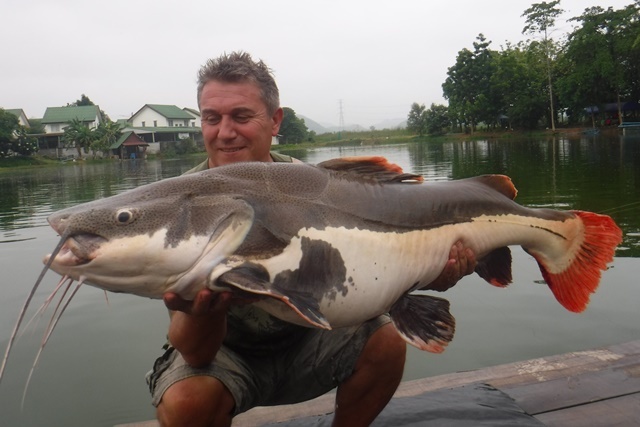 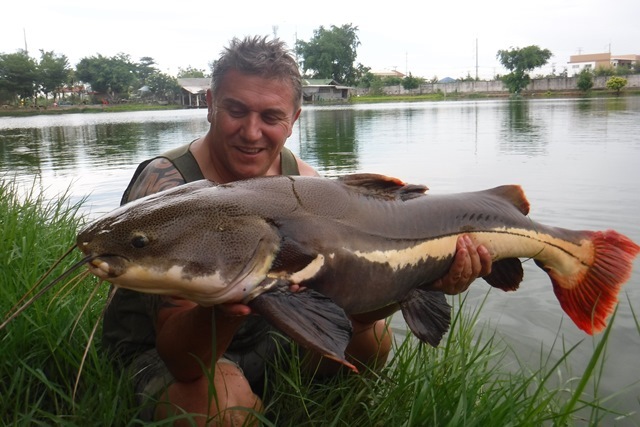 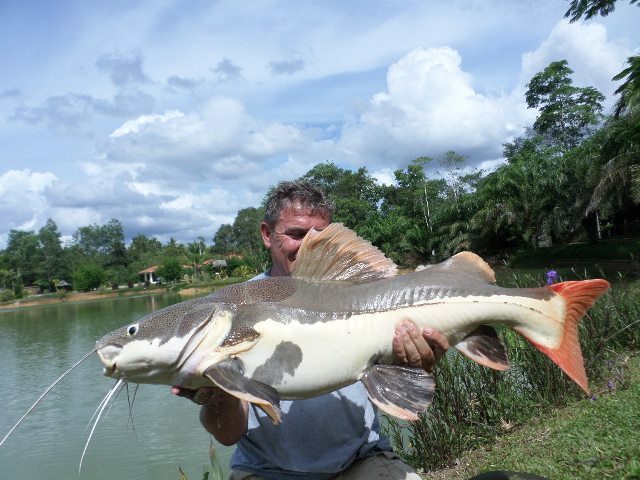 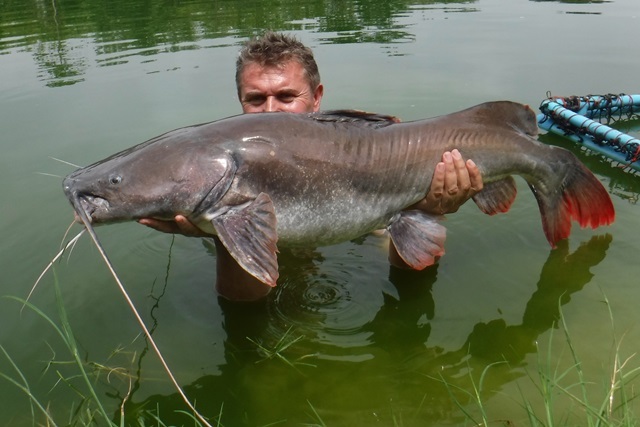 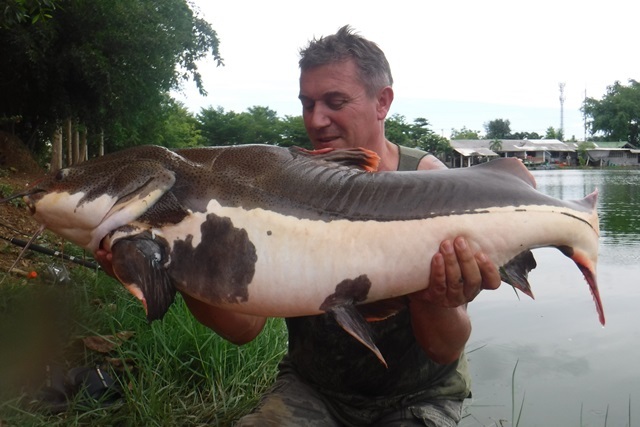 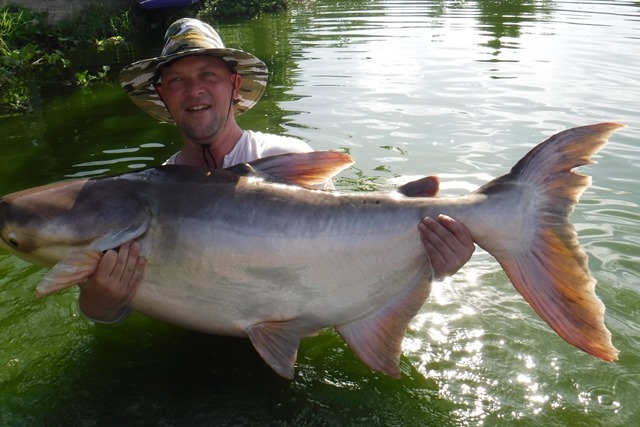 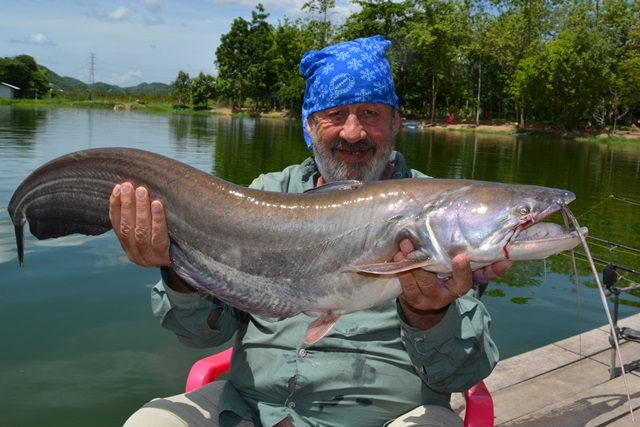 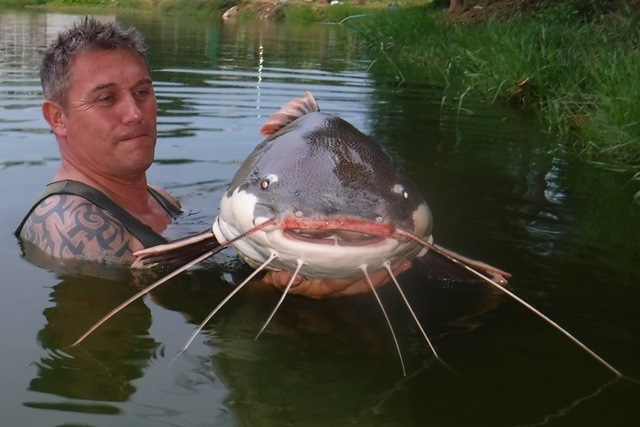 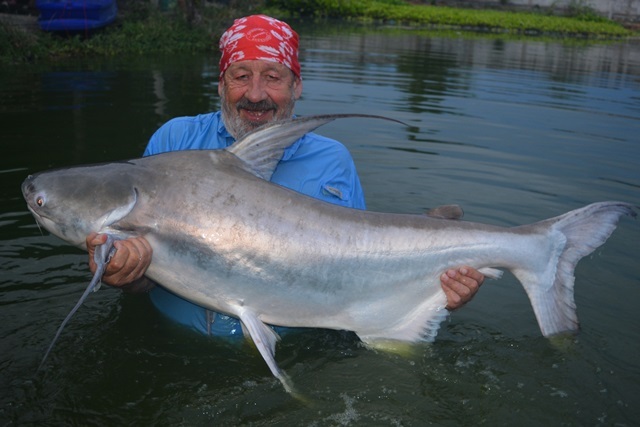 Matt Smith returned after a two year absence, he may not have caught the big Siamese carp he was after but did catch some very nice Mekong catfish. 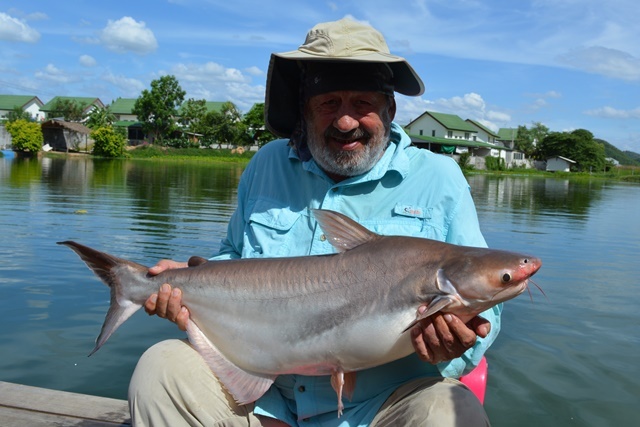 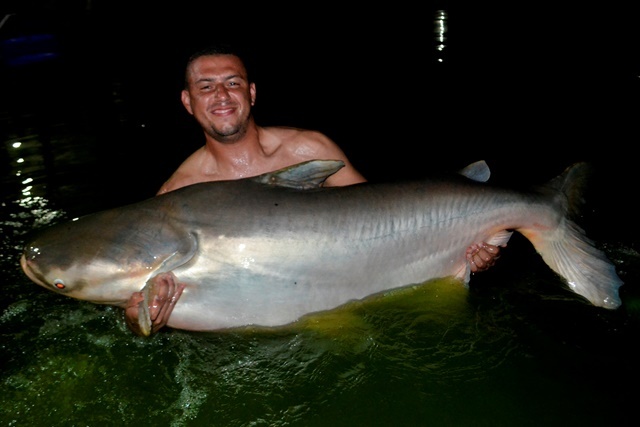 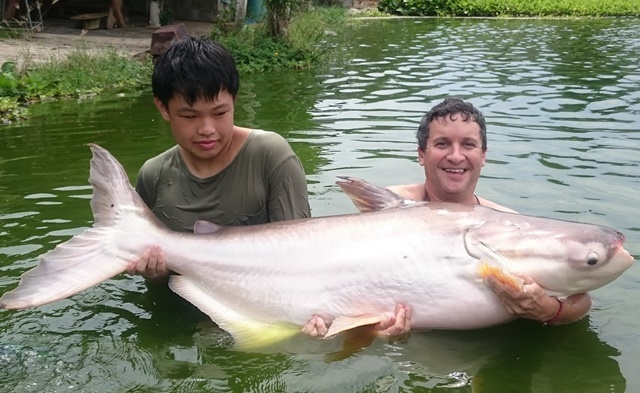 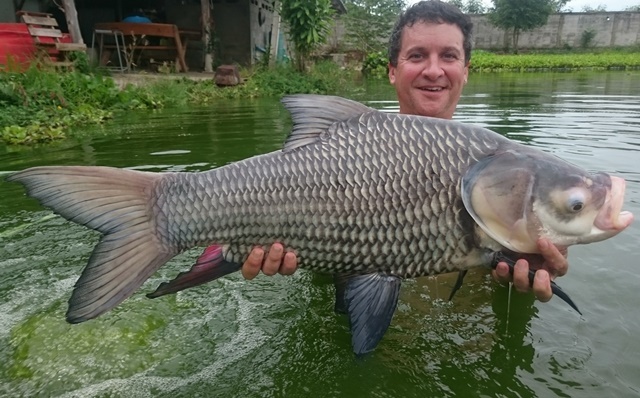 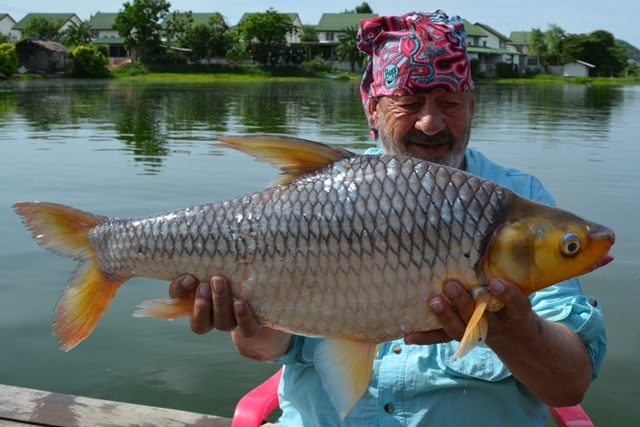 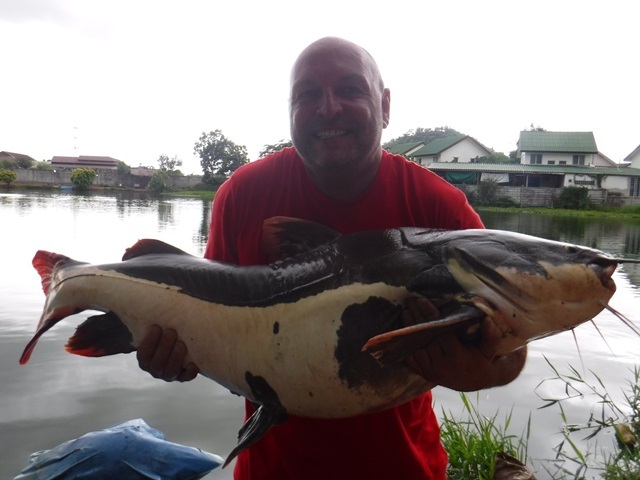 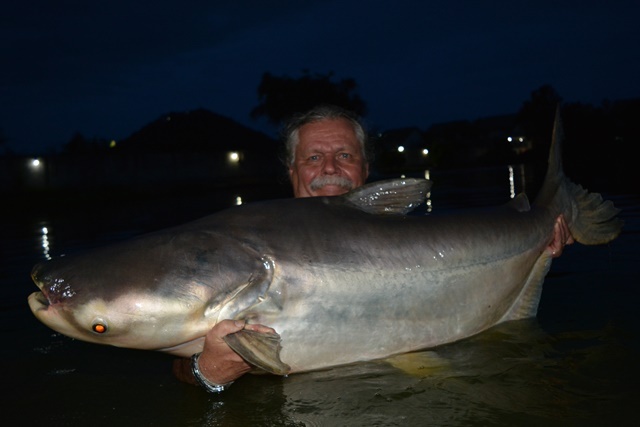 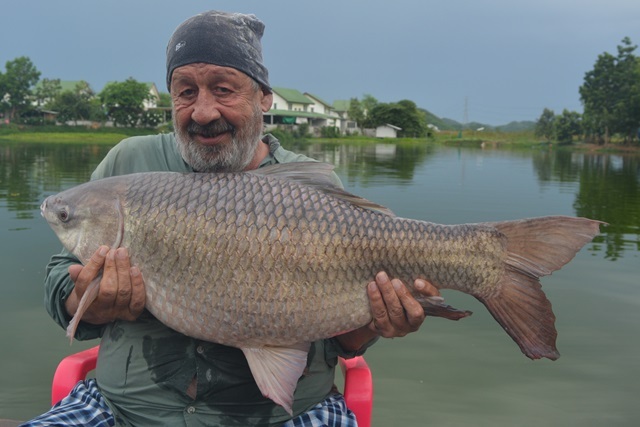 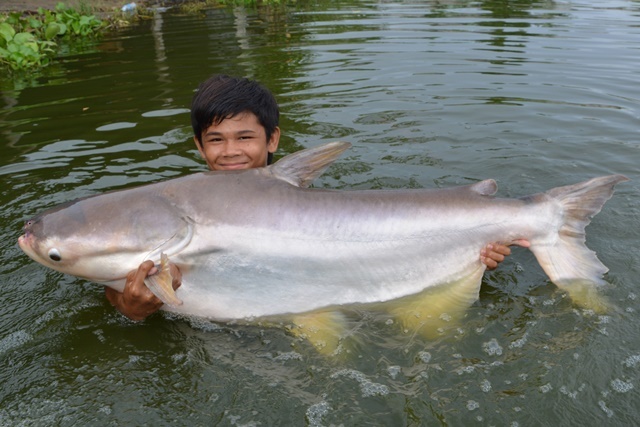 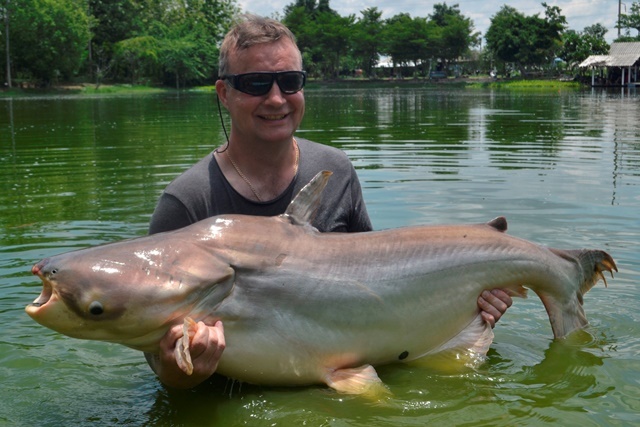 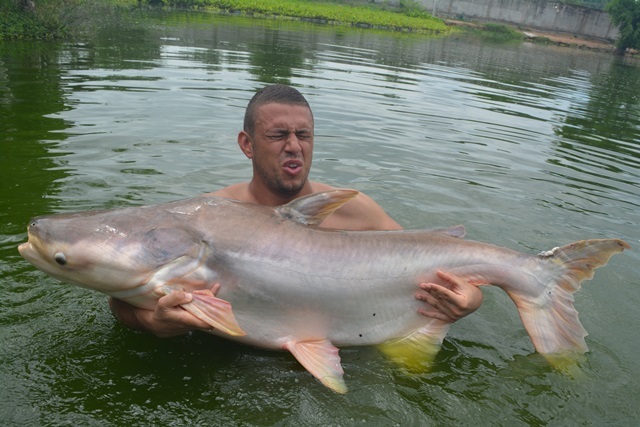 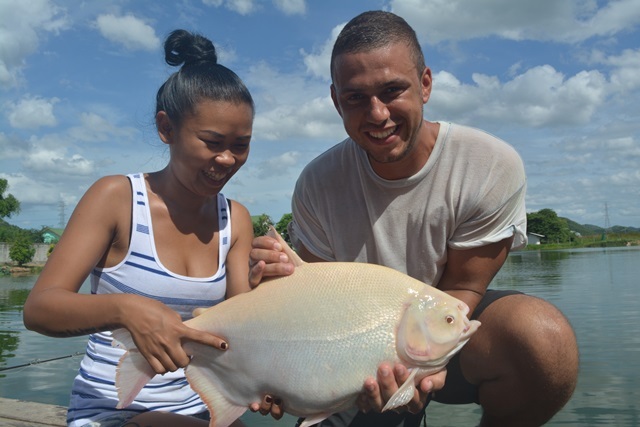 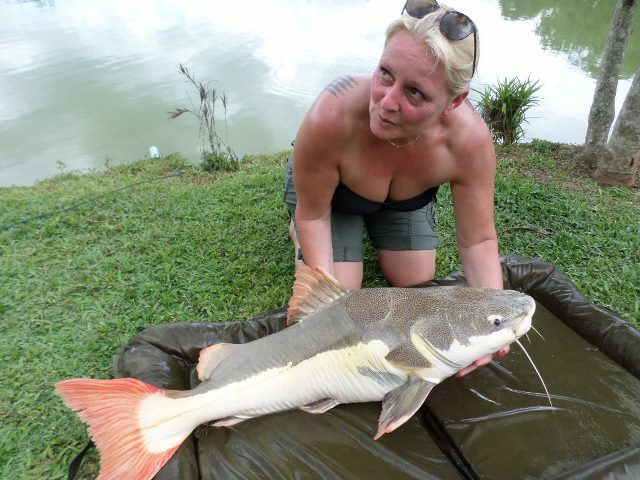 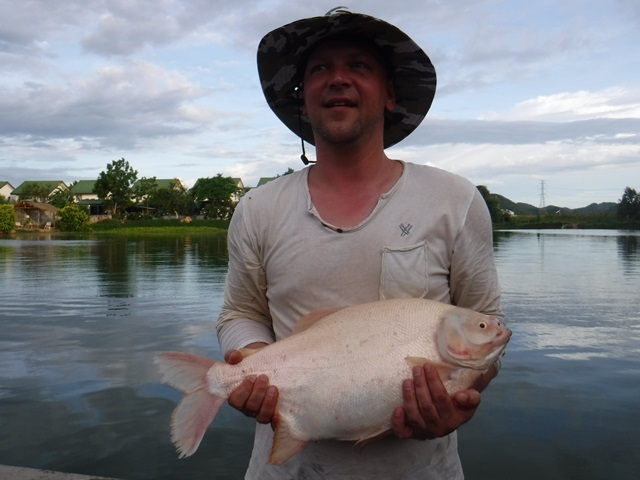 Tap of Bangkok Fishing Guide Service first trip of the month had his customer catching albino pacu, Siamese carp, Juliens golden price carp, Amazon redtail and big-Y catfish. 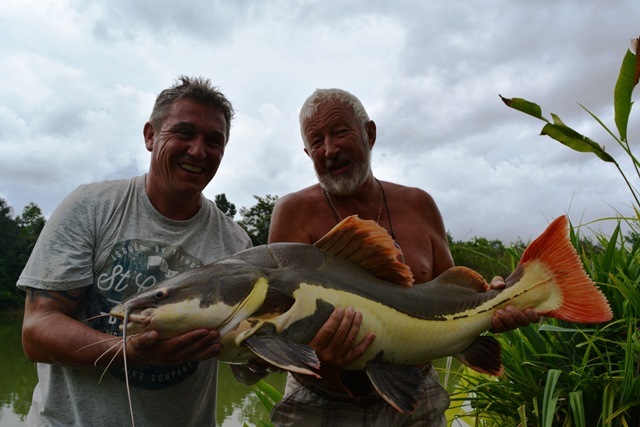 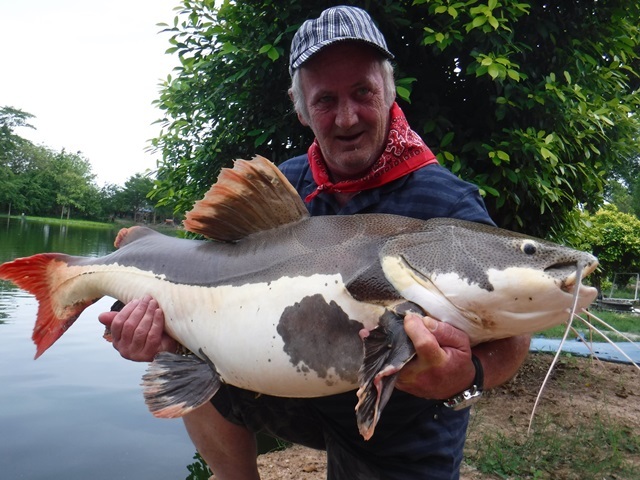 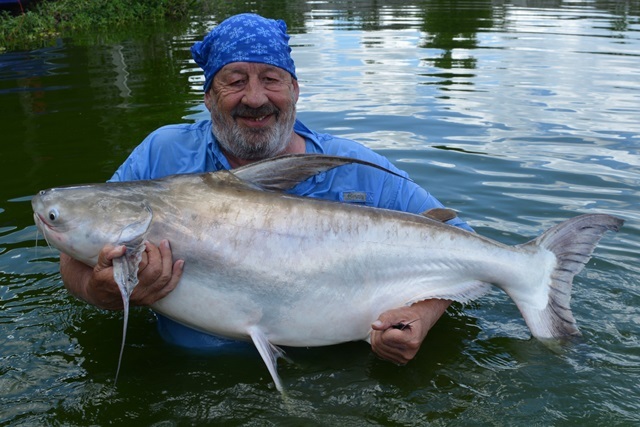 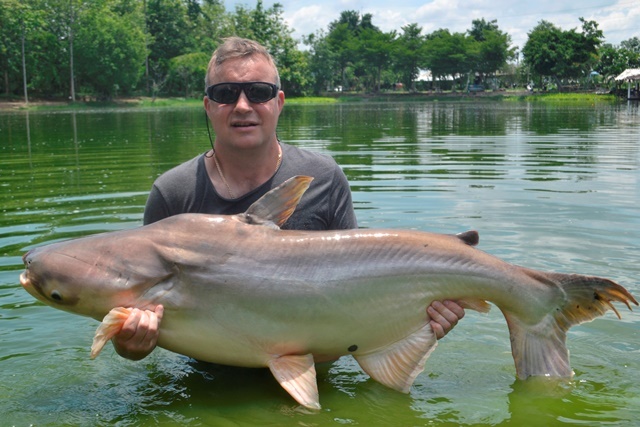 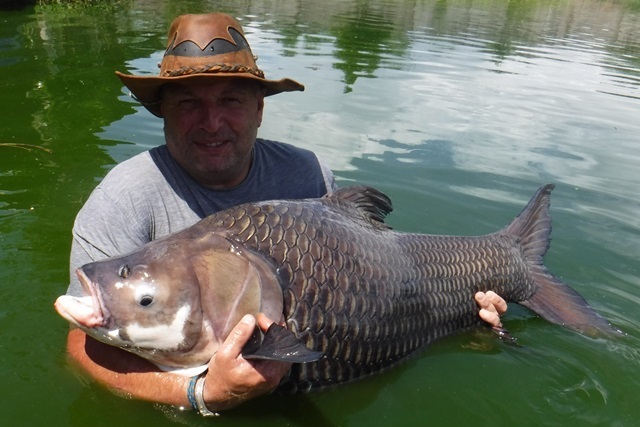 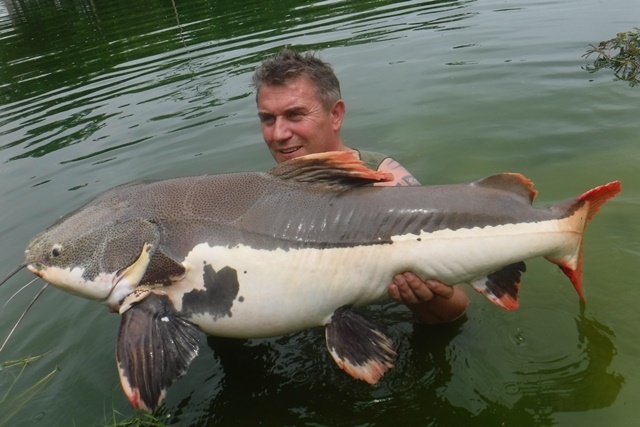 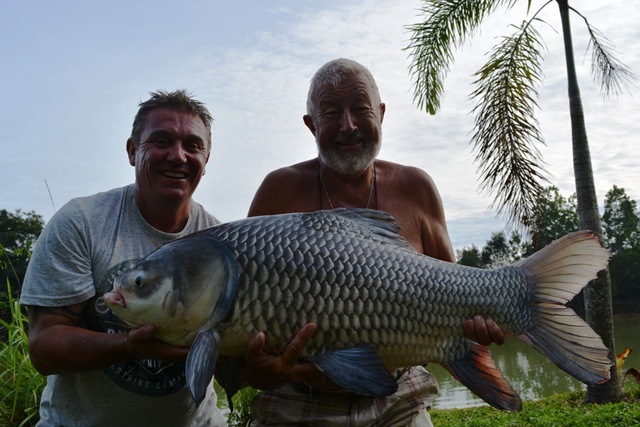 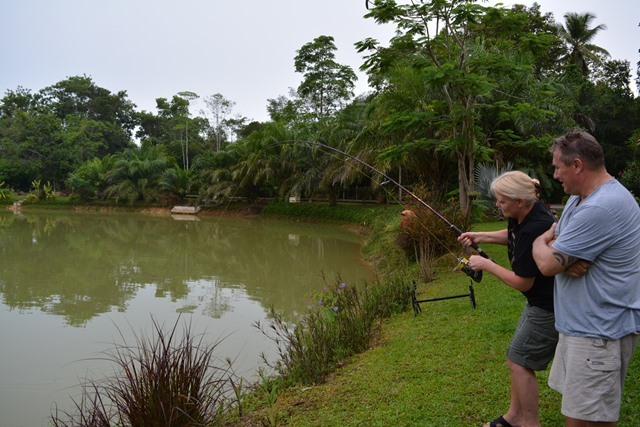 Richard Devitt made his first visit to Palm Tree during the month catching Siamese carp as well as both Amazon and Thai redtailed catfish.